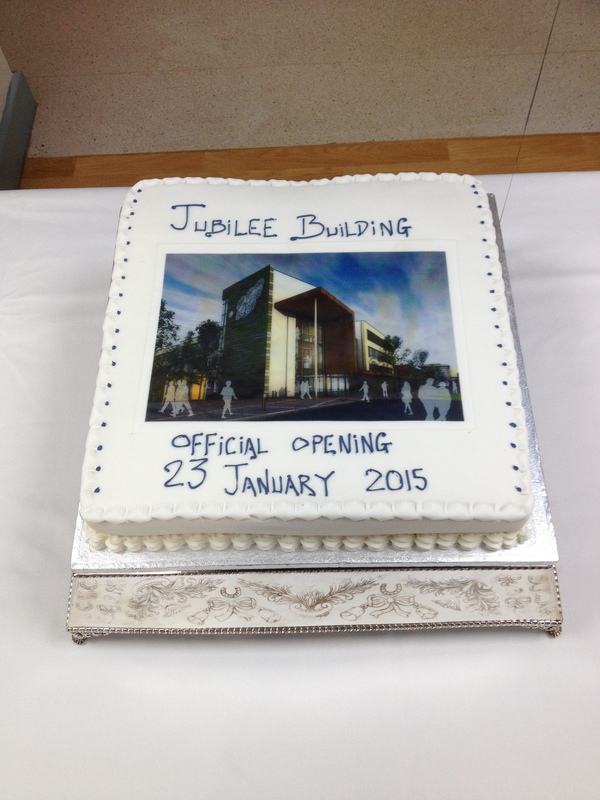 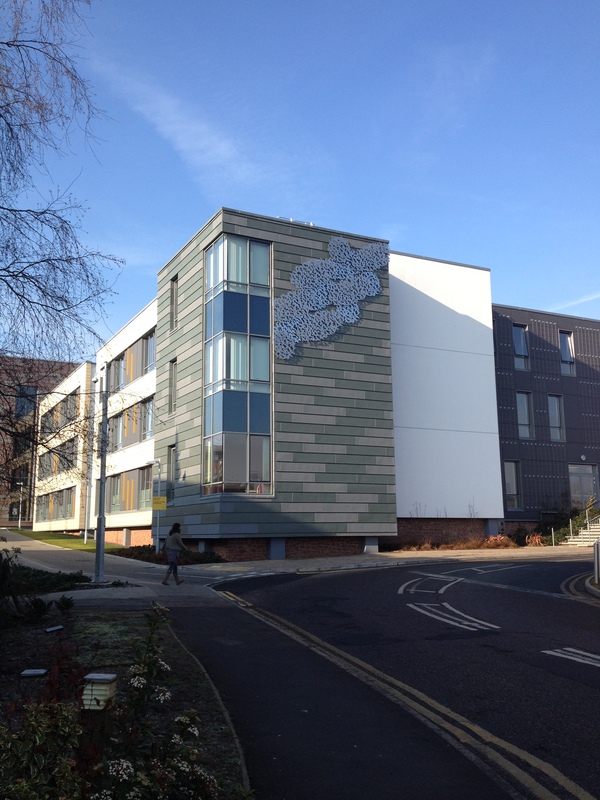 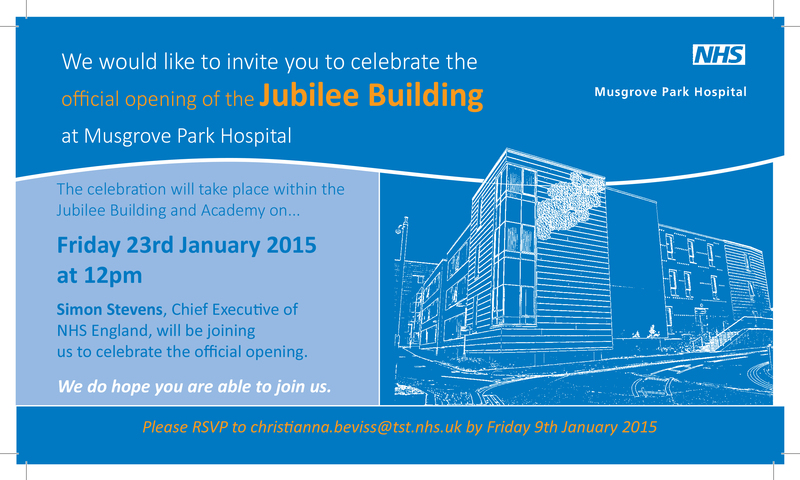 Simon Stevens, Chief Executive of NHS England was supposed to be doing the honours today at the Official Opening of the Jubilee Building, but for unforeseen reasons he couldn’t come ! 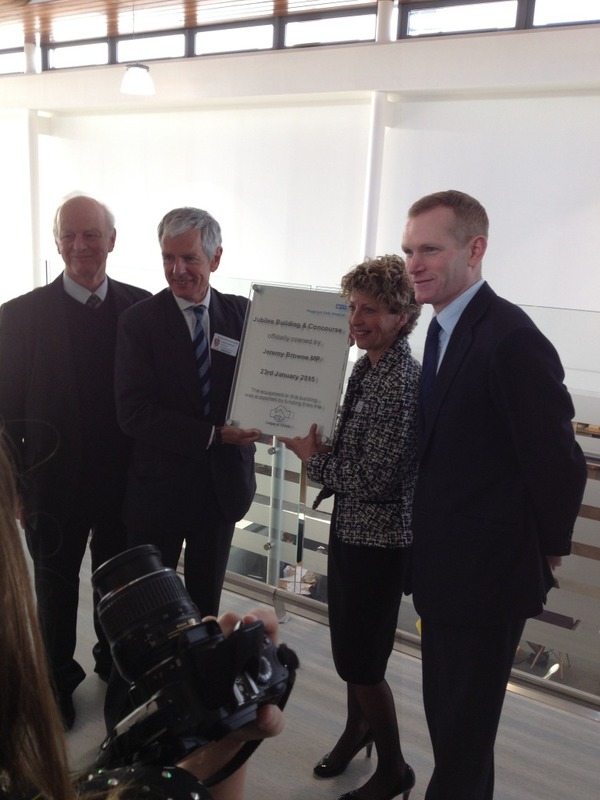 His place was taken by the local MP Jeremy Browne, who was able to stand in at very short notice. 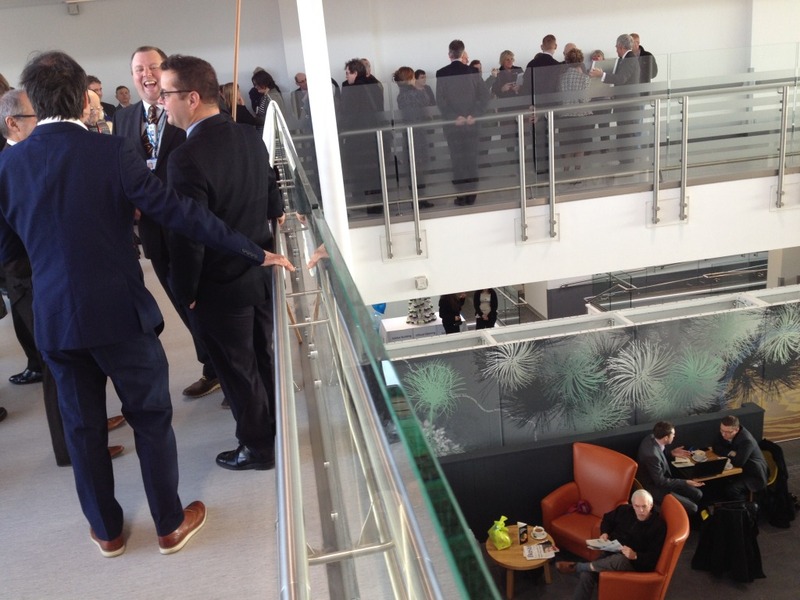 I am sure that everyone was disappointed not to have the head honcho in attendance. 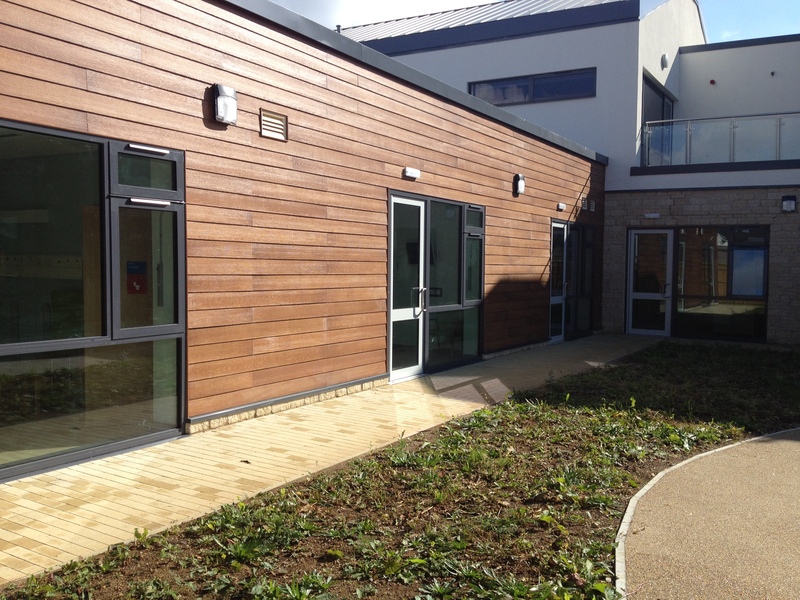 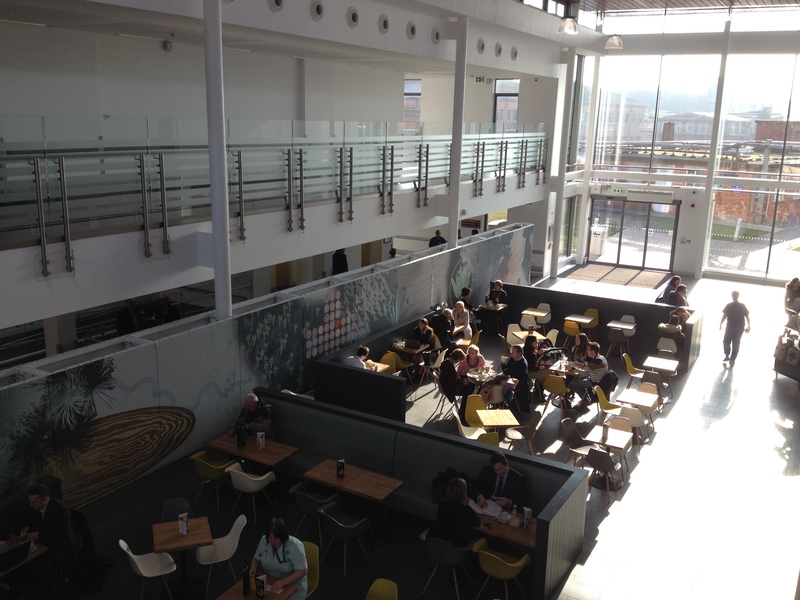 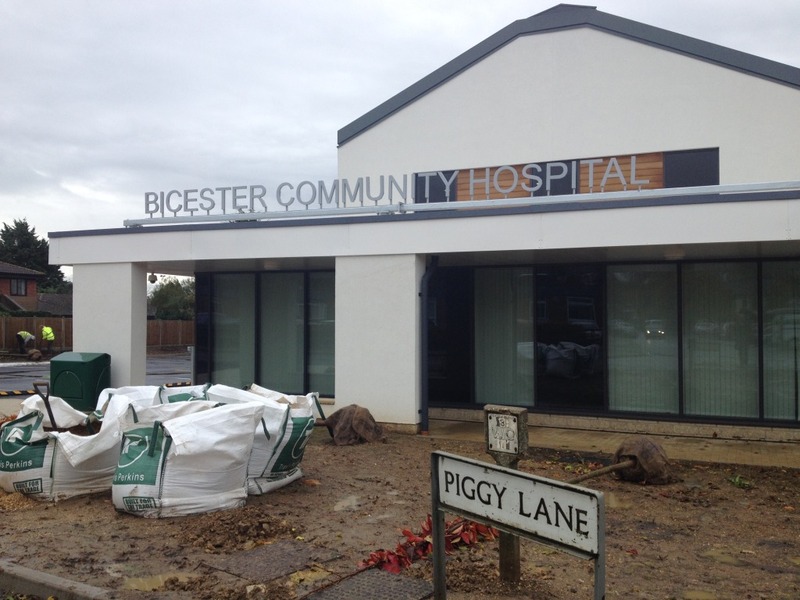 Everyone has worked incredibly hard on the project, from the Trusts’s Capital Projects team, BDP Architects and BAM to medical and ancillary staff. 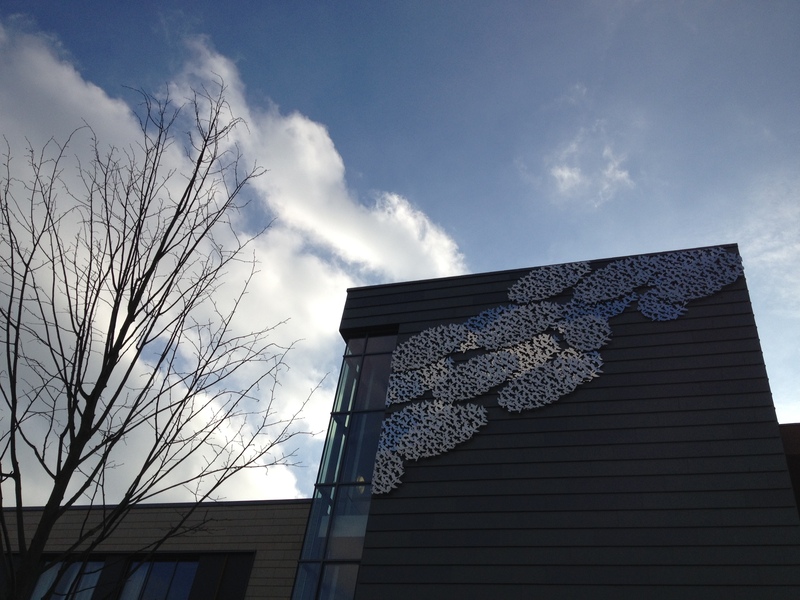 However, it was a lovely day all round and the weather was perfect for showing off the building. 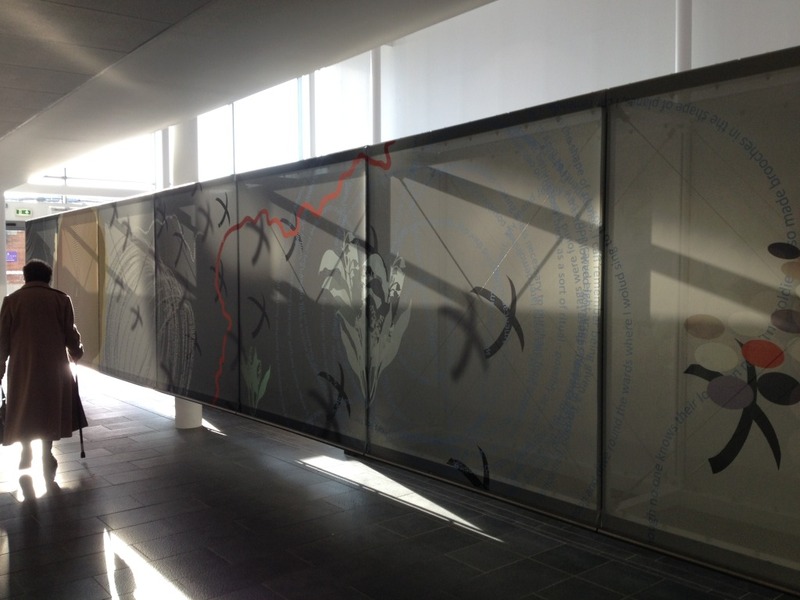 This was the first time that I had seen both my projects – ‘70 years on…” & ‘Murmuration’ fully installed. 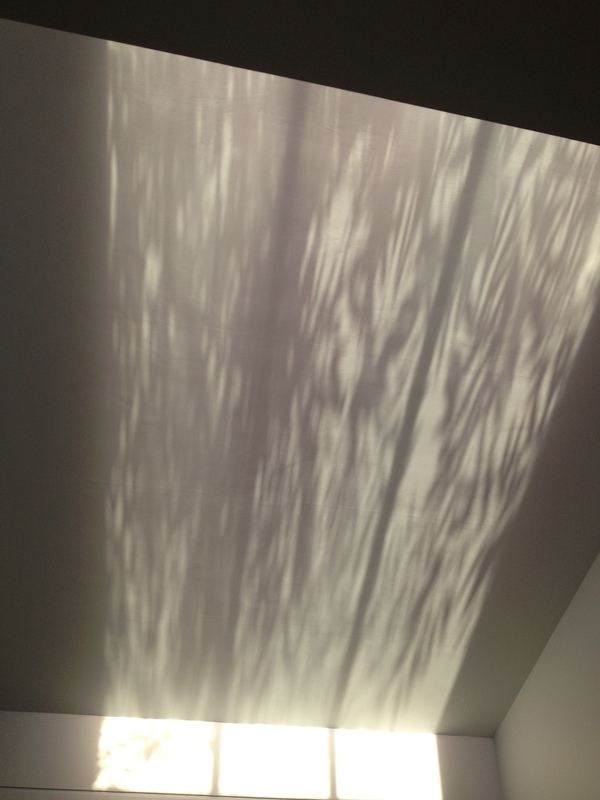 I couldn’t have asked for a better day to see them. 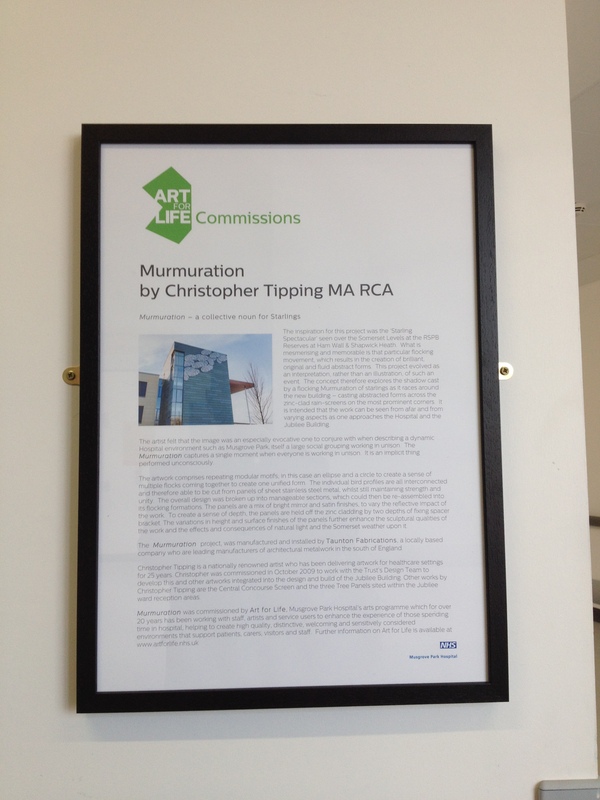 The Art for Life team, led by Lisa Harty have done an amazing job in co-ordinating and presenting the work. 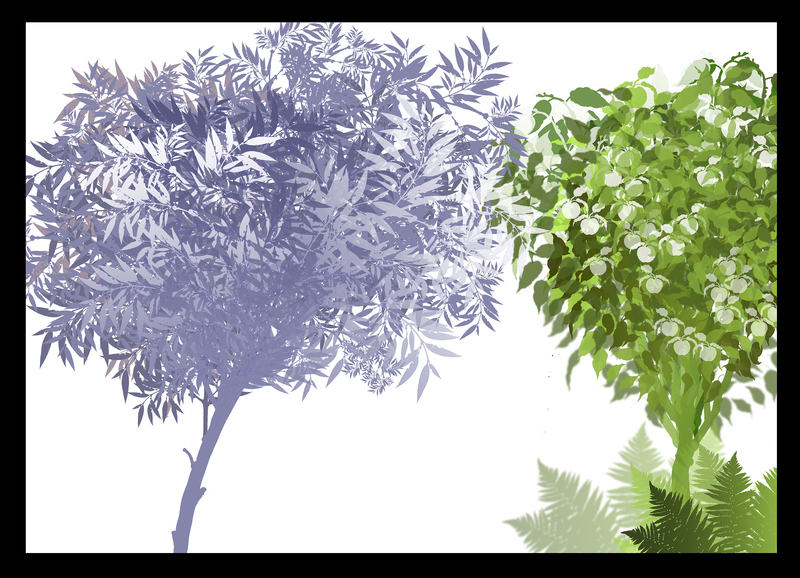 I am very grateful to them. 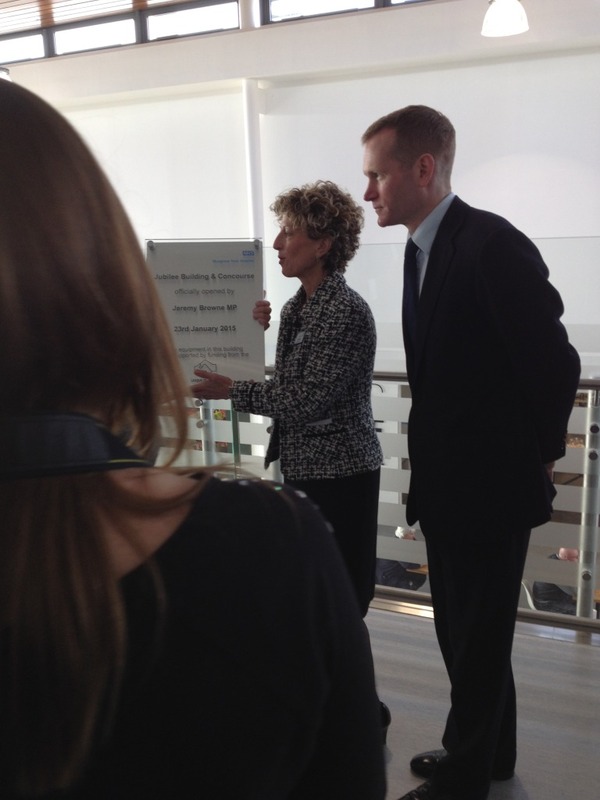 Jo Cubbon, Chief Executive Officer at Musgrove Park Hospital, with Jeremy Browne MP at the Official Opening Ceremony. 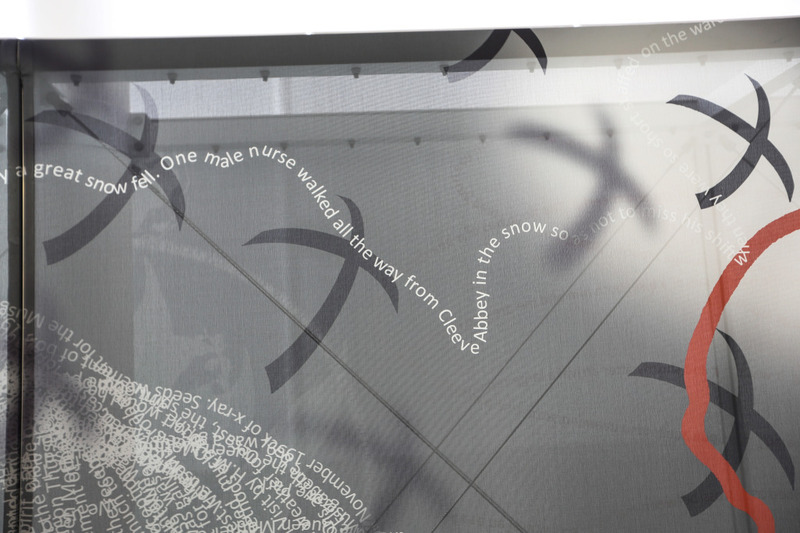 Digital Printing onto vinyl mesh fabric applied to a stainless steel and aluminium ladder frame to create the tensile screen. 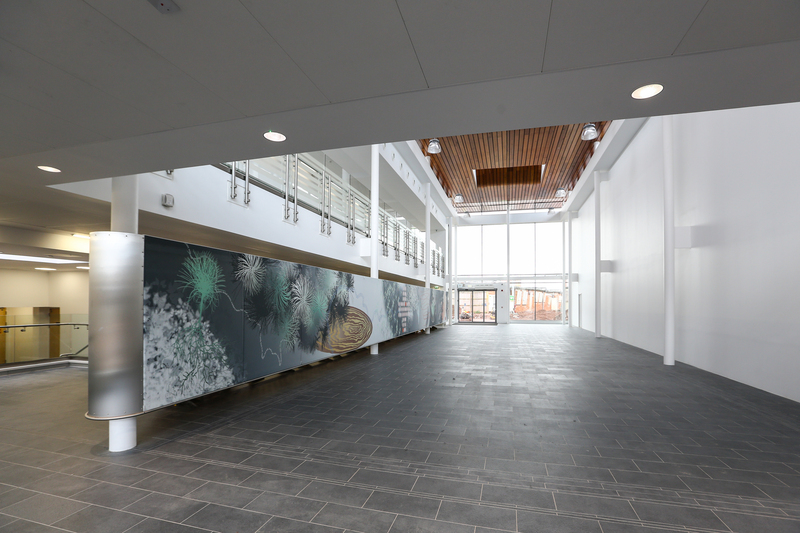 I was commissioned on several projects in relation to the new building as well as being involved with the Trust as Lead Artist for almost 10 years, throughout their 10 year programme of regeneration and new build. 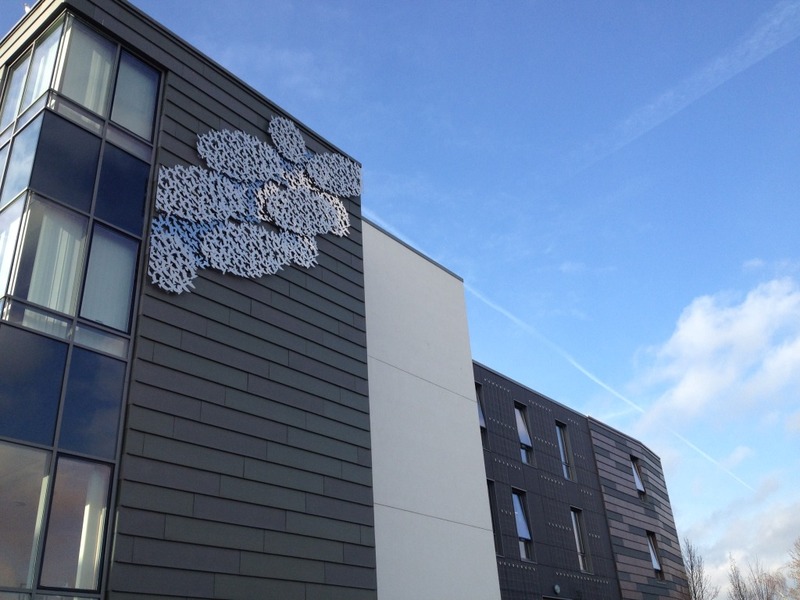 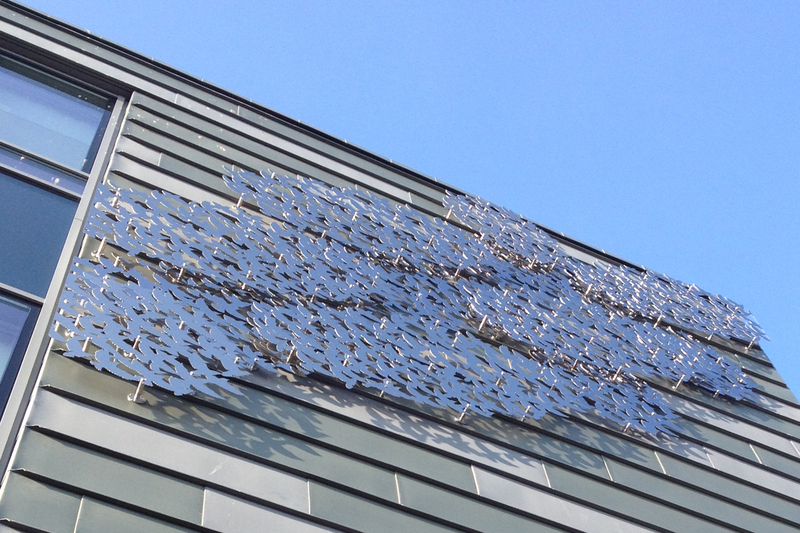 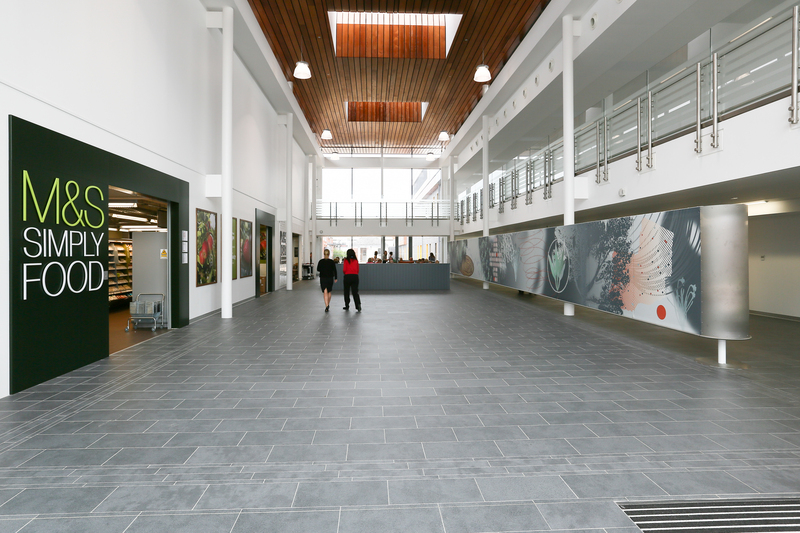 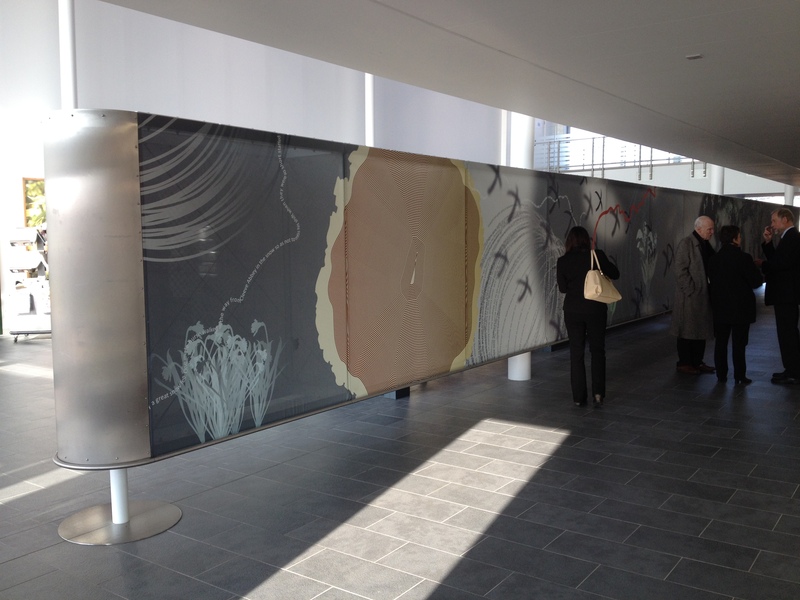 The art project is now completed on site with all the digitally printed panels installed. 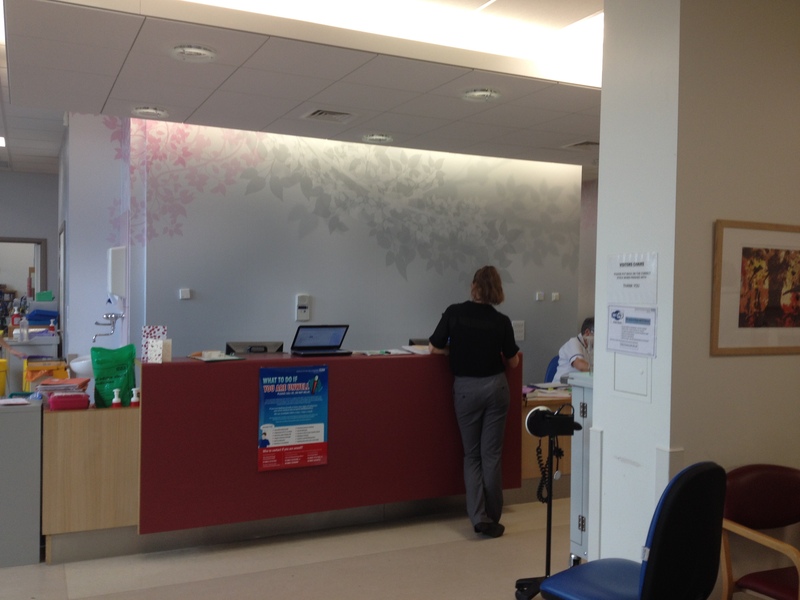 I visited on Friday 14th November to review progress & the following images are taken from that visit. 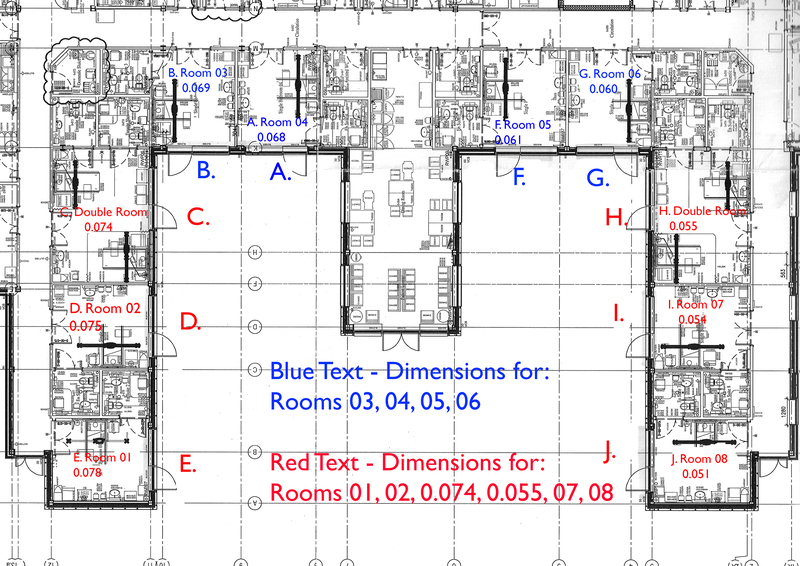 Each of the 10 ward rooms has a variation upon a single design. 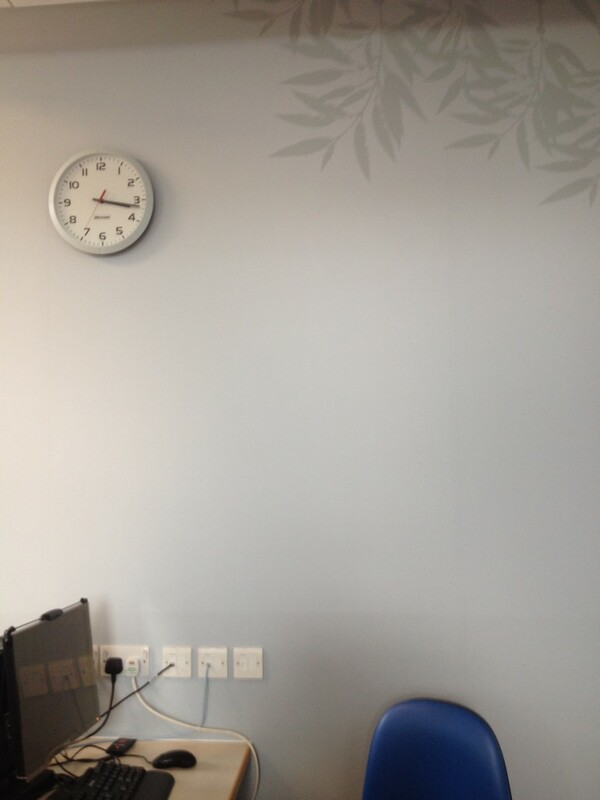 This was achieved for both economy & to meet a very tight deadline. 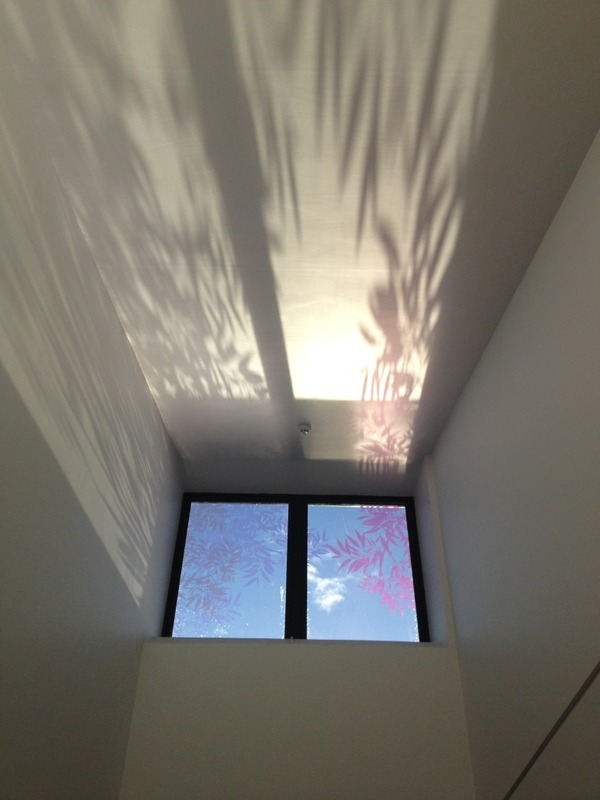 The brief was built around the need for privacy in the rooms. 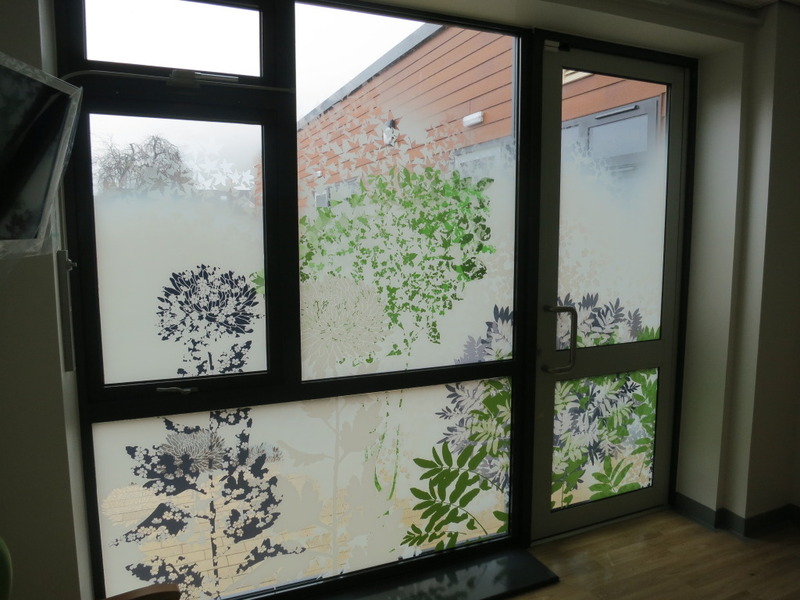 Large glazed screens open up onto a landscaped courtyard. 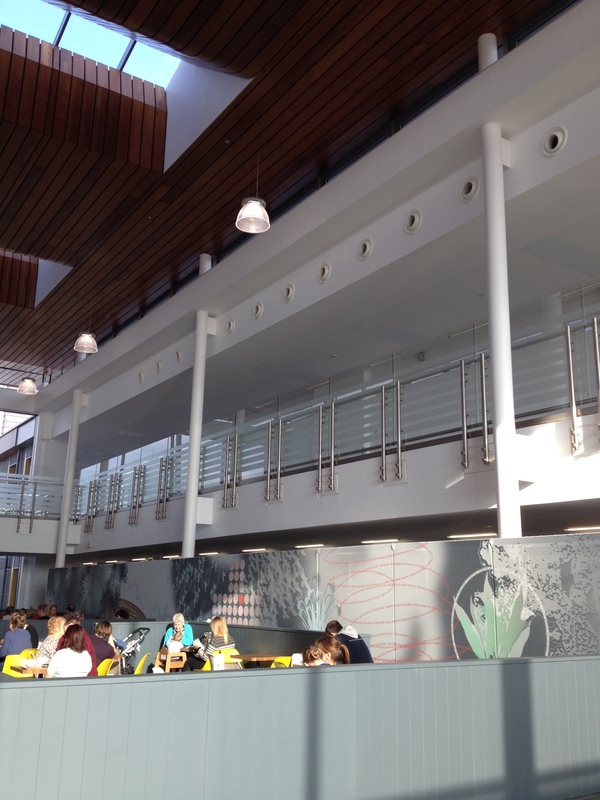 Although these spaces are being planted with trees and some small shrubs, most of the space would be turfed. 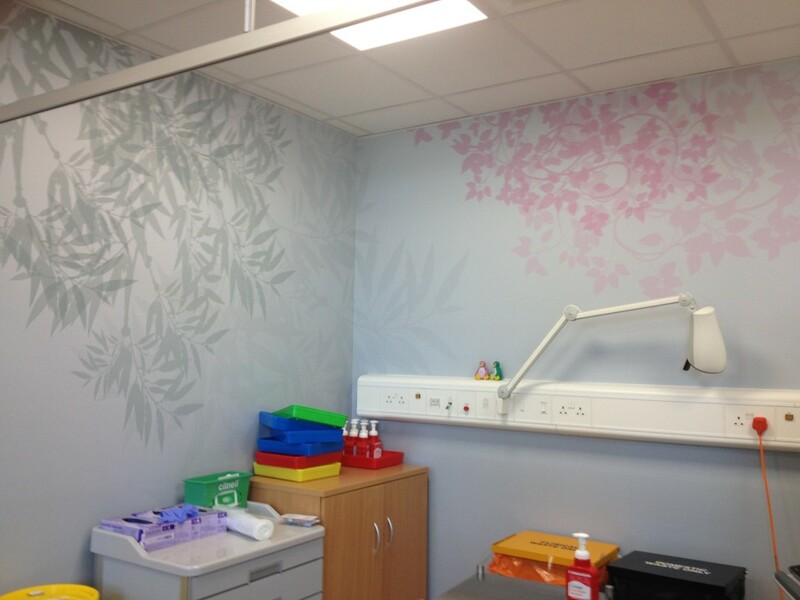 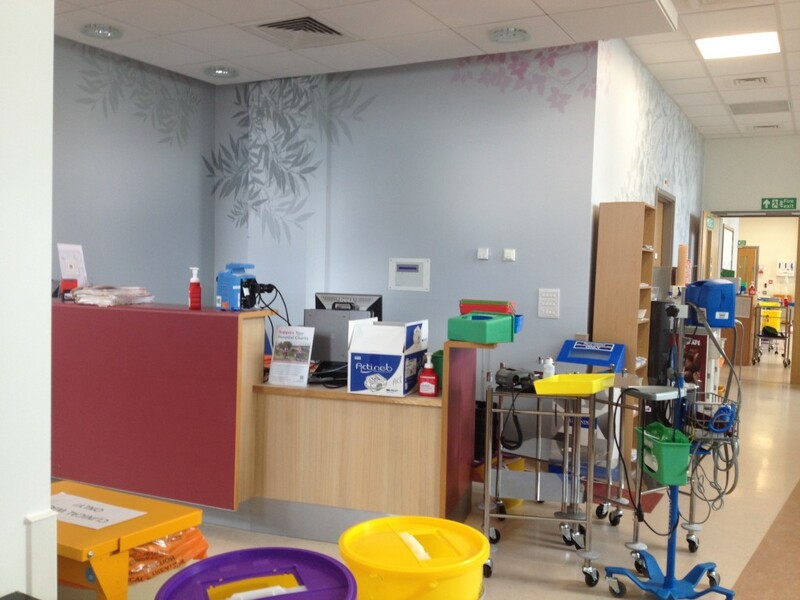 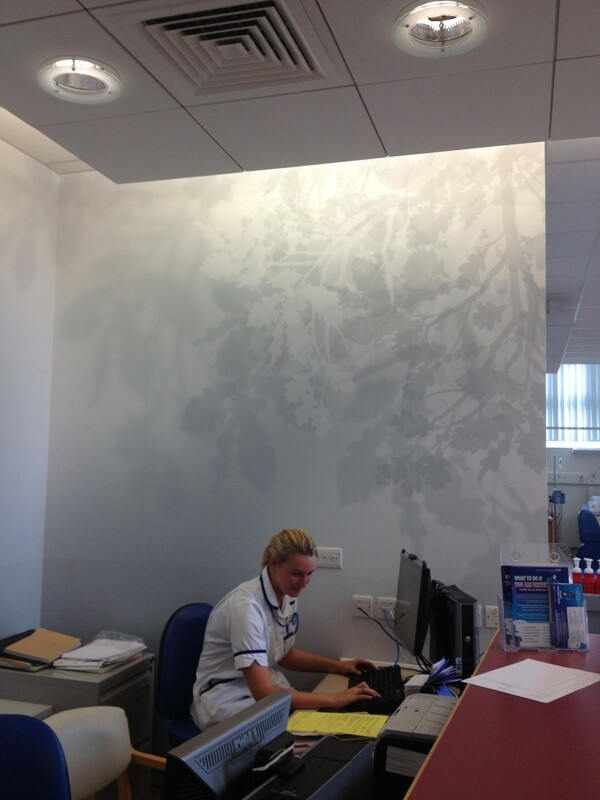 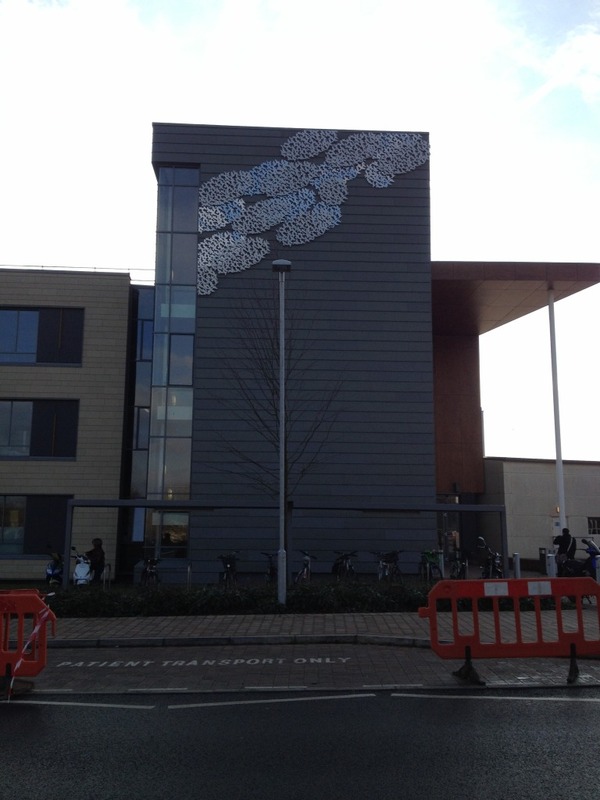 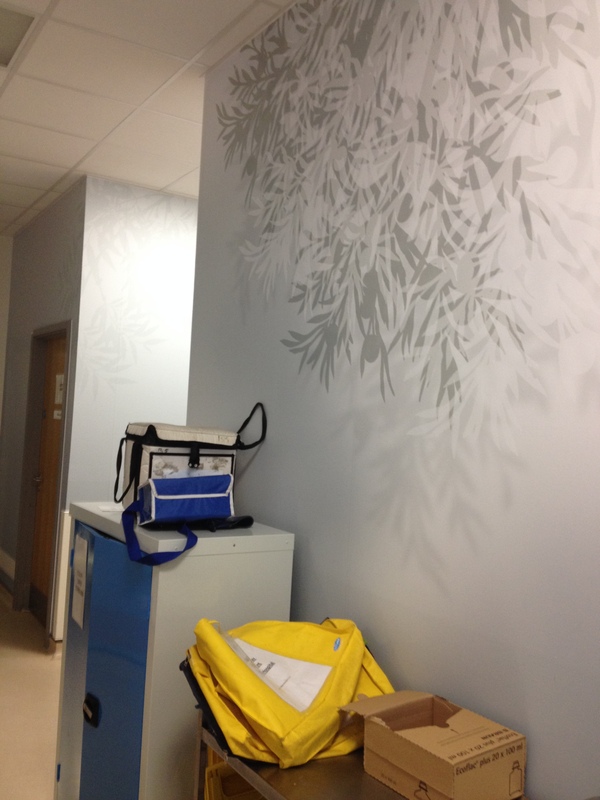 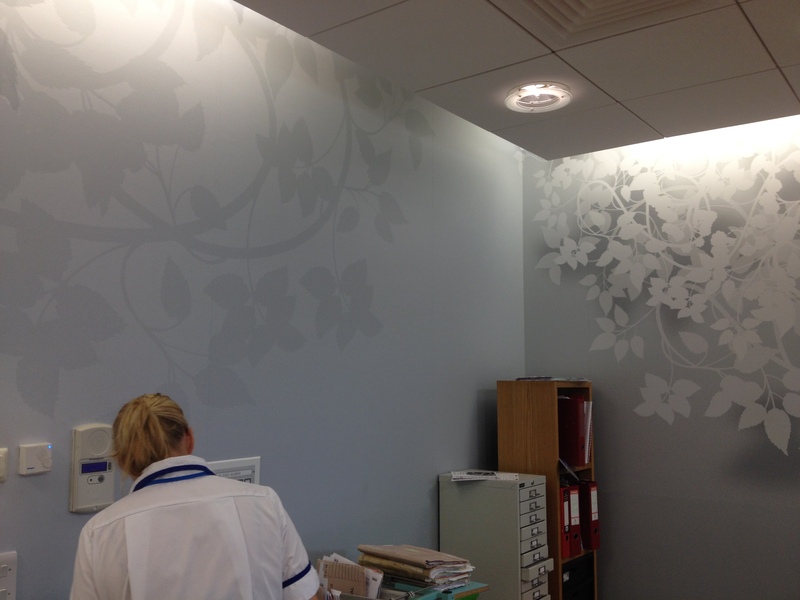 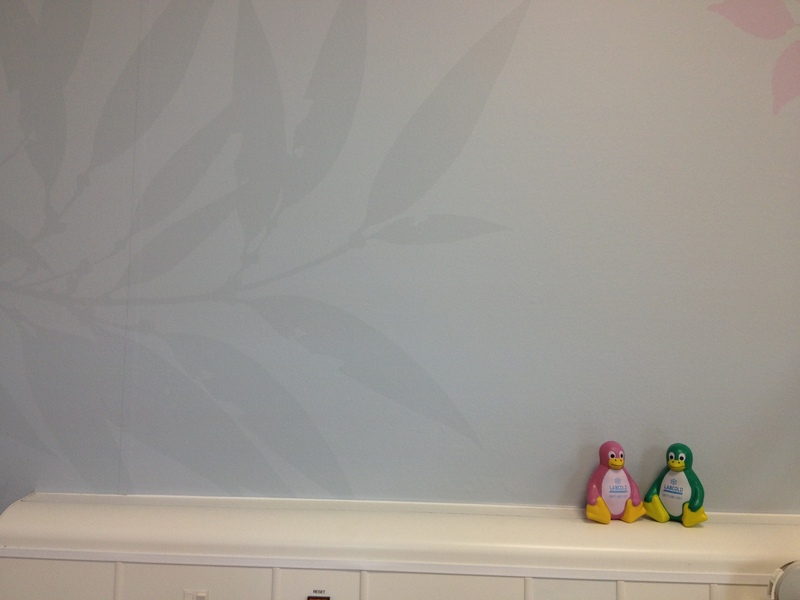 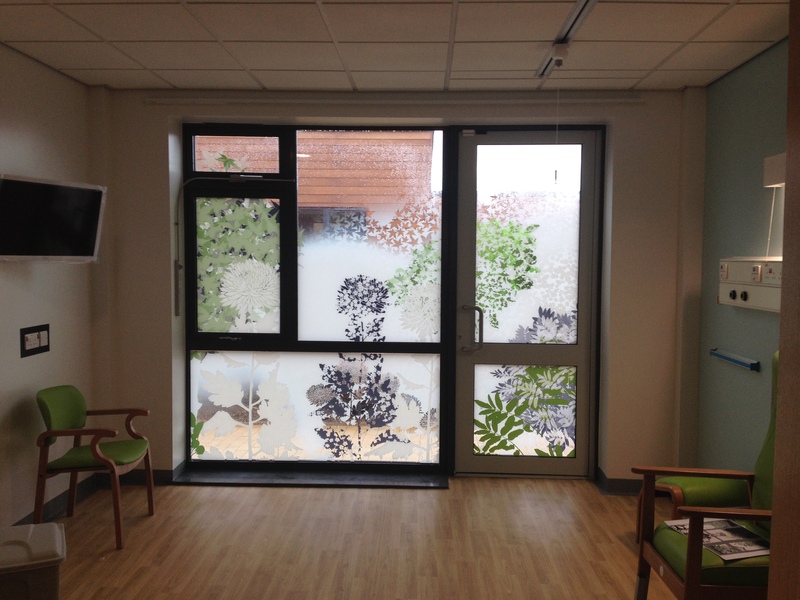 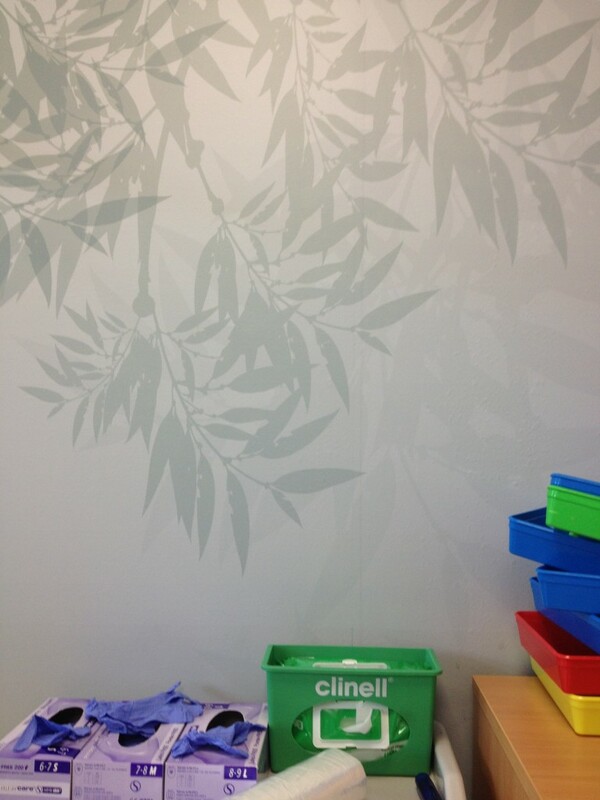 Patients, staff & visitors can still see out from the windows in the knowledge that their privacy was being maintained. 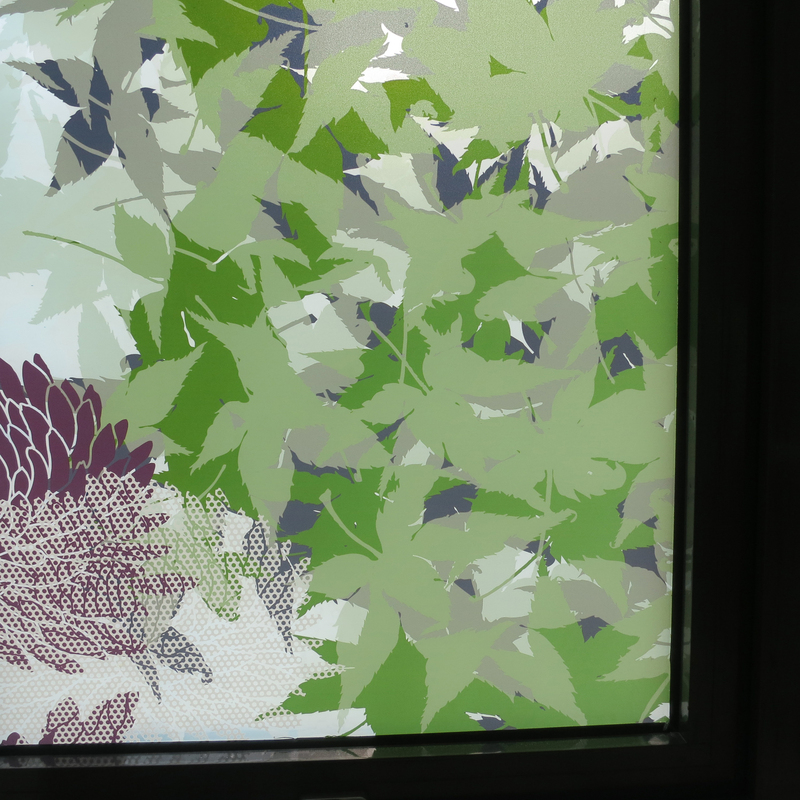 Opaque and transparent layers with drawn & cut out detailing were created to provide some variation & changeability in the surface. 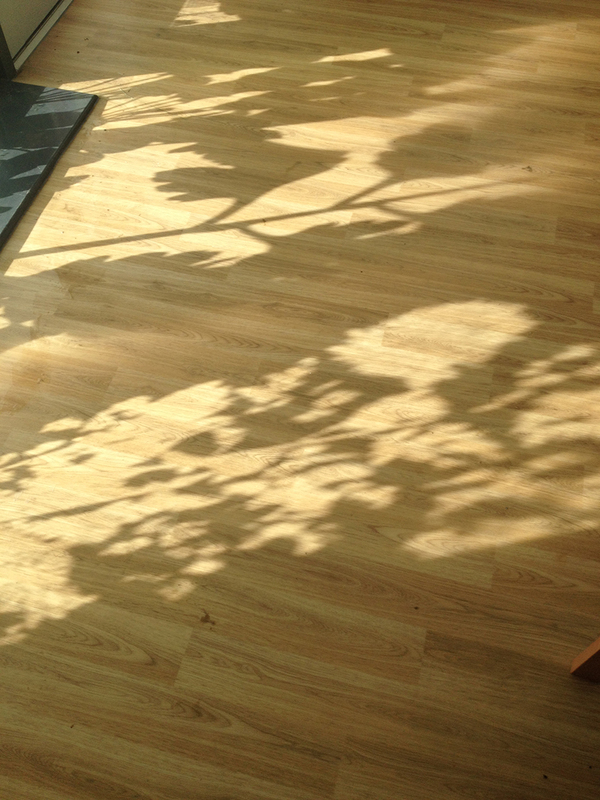 When the sun comes out, the shadows follow. 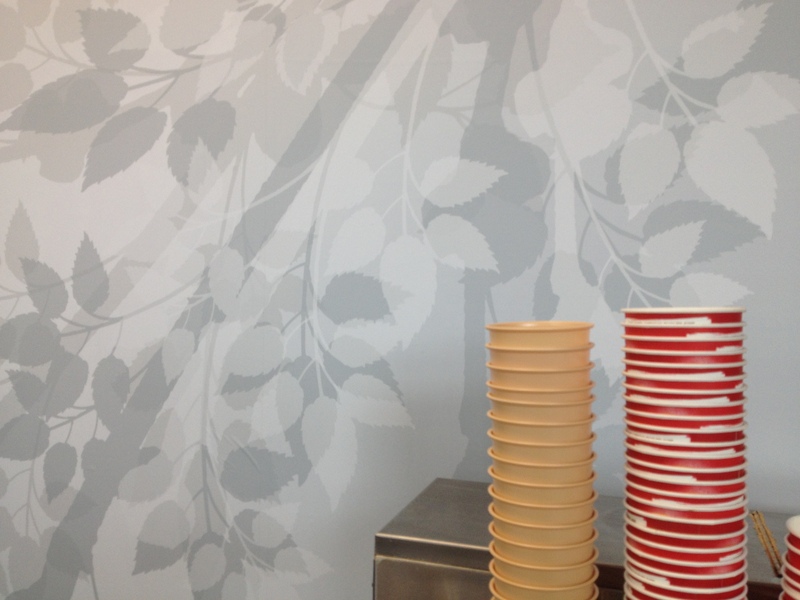 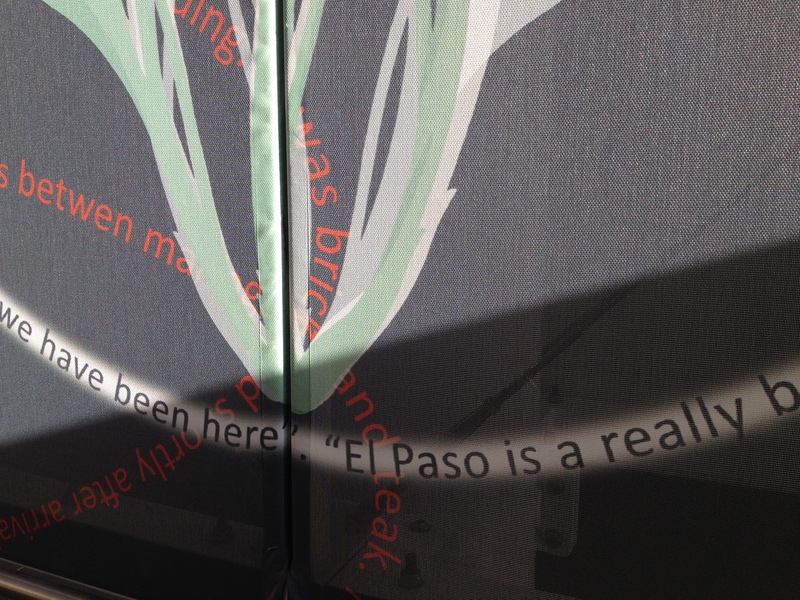 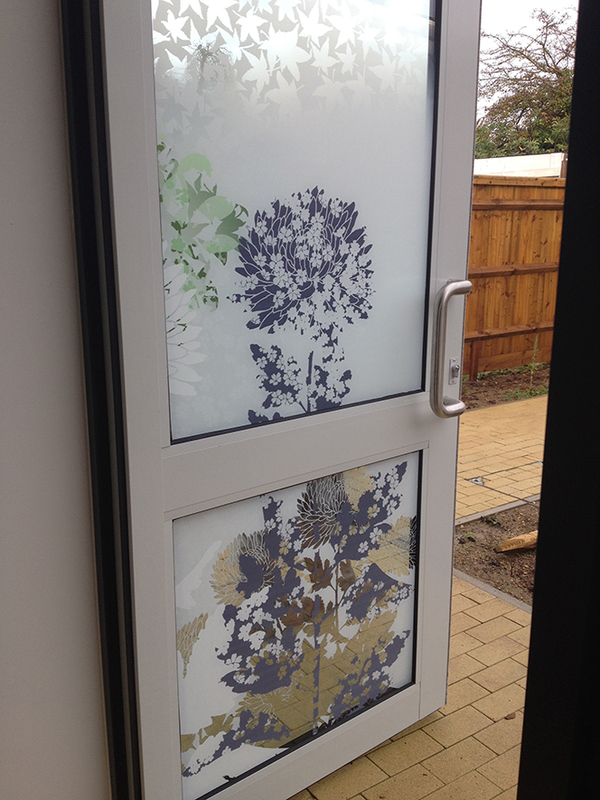 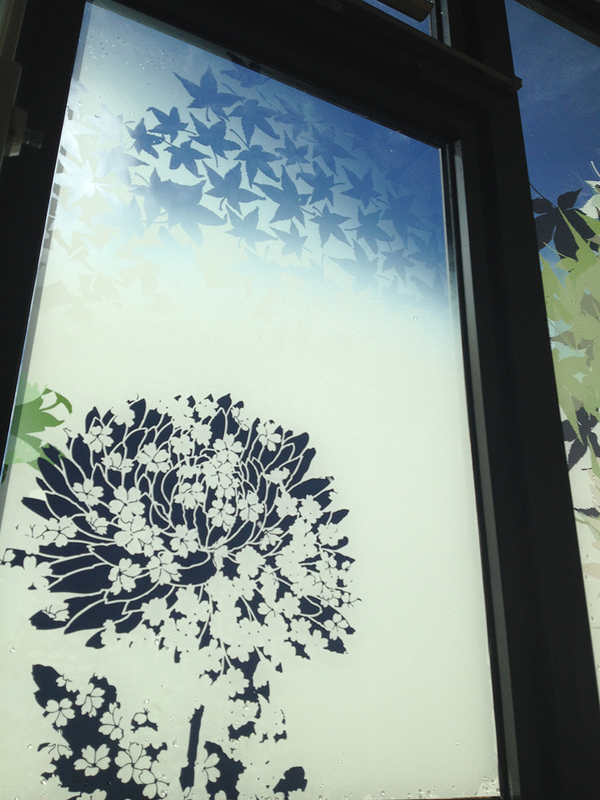 Detail: Section of digitally printed glazing vinyl installed. 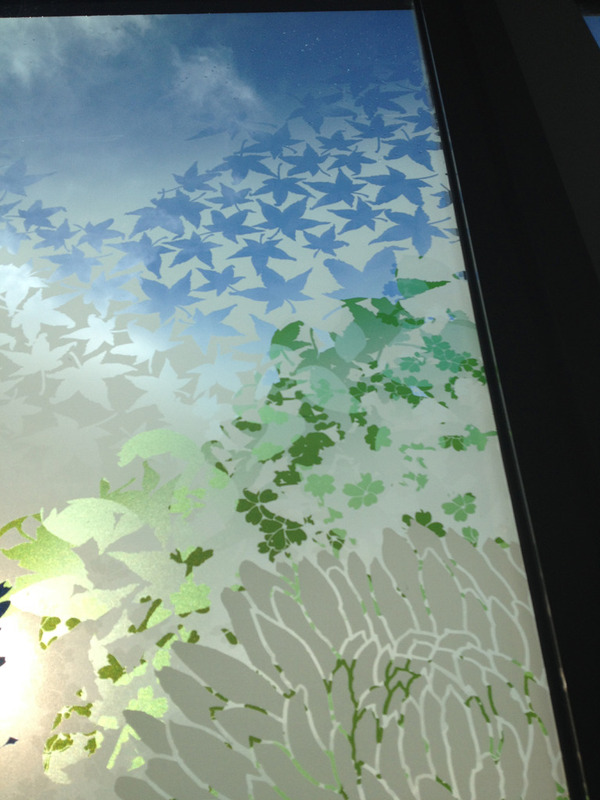 The project was approved last week and the files went to print earlier this week. 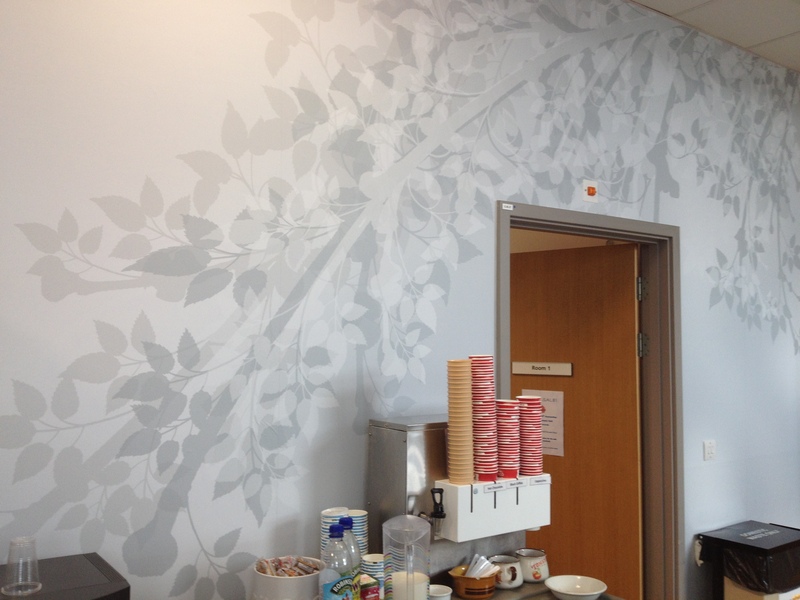 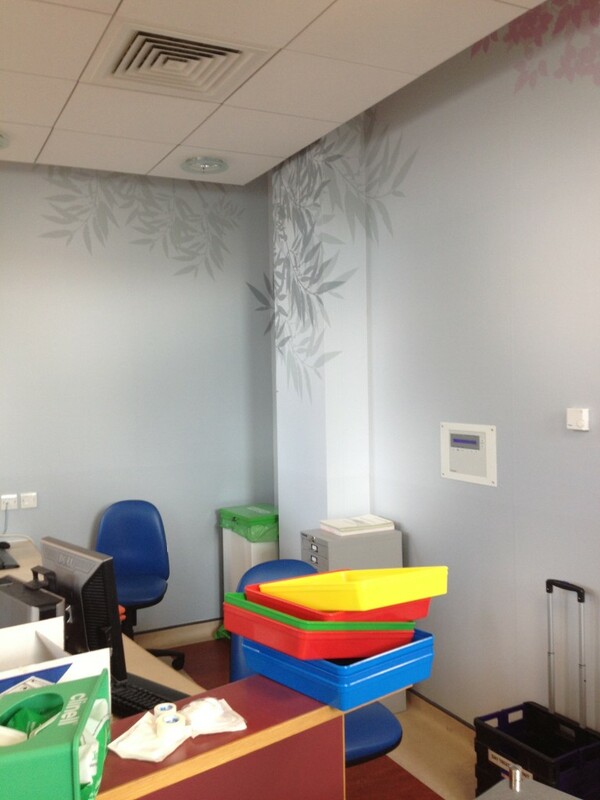 The last two days have seen most of the digitally printed vinyl installed. 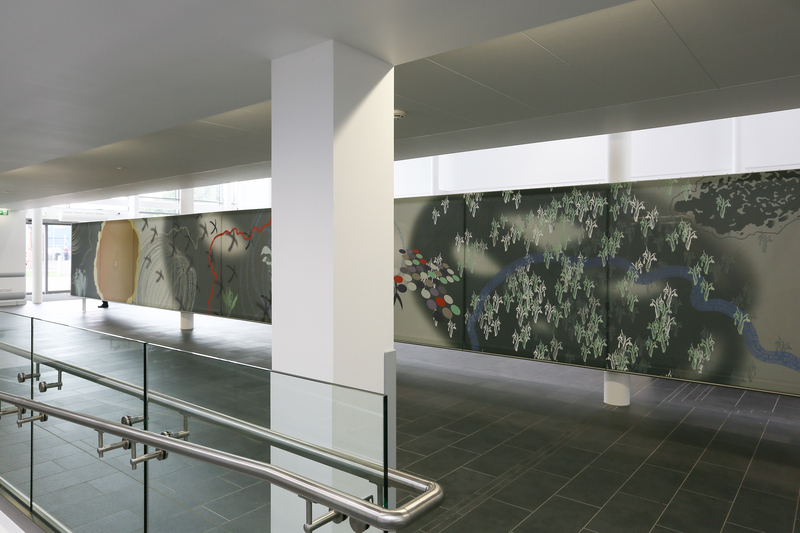 The Central Concourse Screen ’70 years on…’ was created to celebrate the delivery of the Jubilee Surgical Building & the 70th Anniversary of Musgrove Park Hospital. 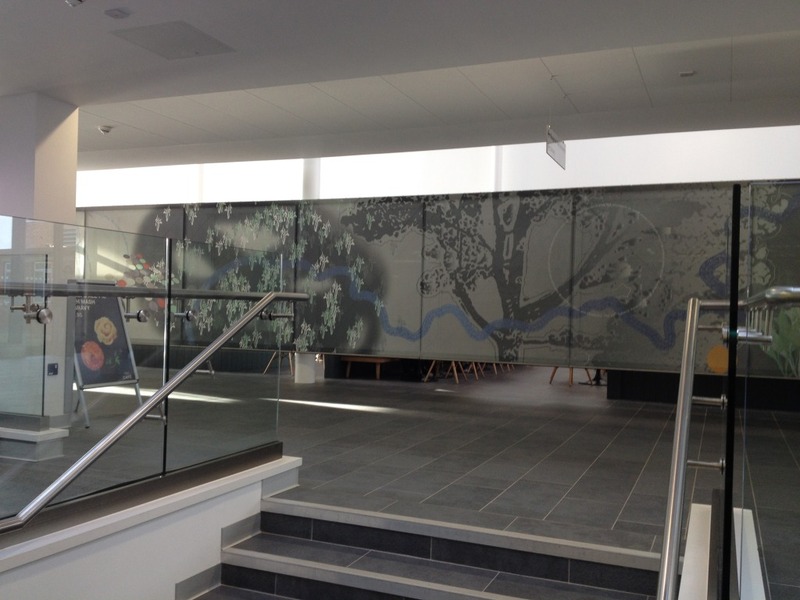 The project was Heritage Lottery funded. 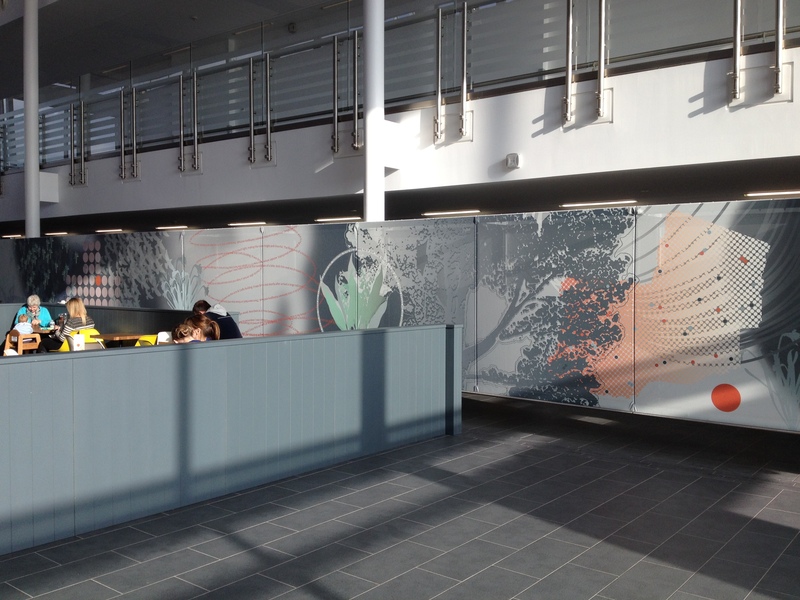 The work is presented as a digitally printed tensile fabric screen made of 26 individually printed panels. 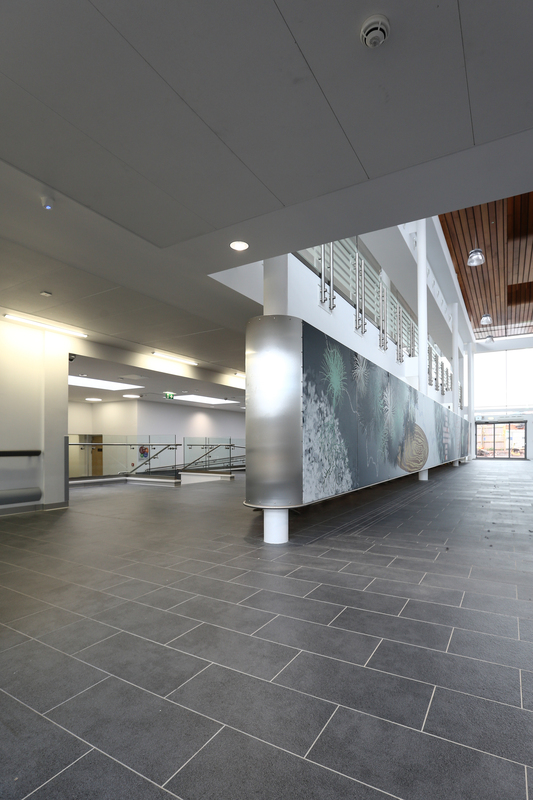 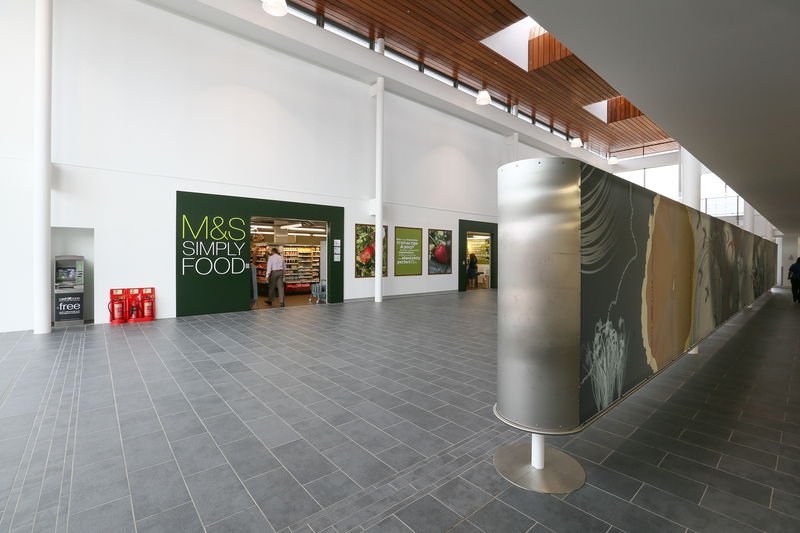 It is supported by a bespoke lightweight aluminium & stainless steel double-sided ladder frame 21m x 1.8m, which is itself hung from 3 steel supporting columns of the Central Concourse building. 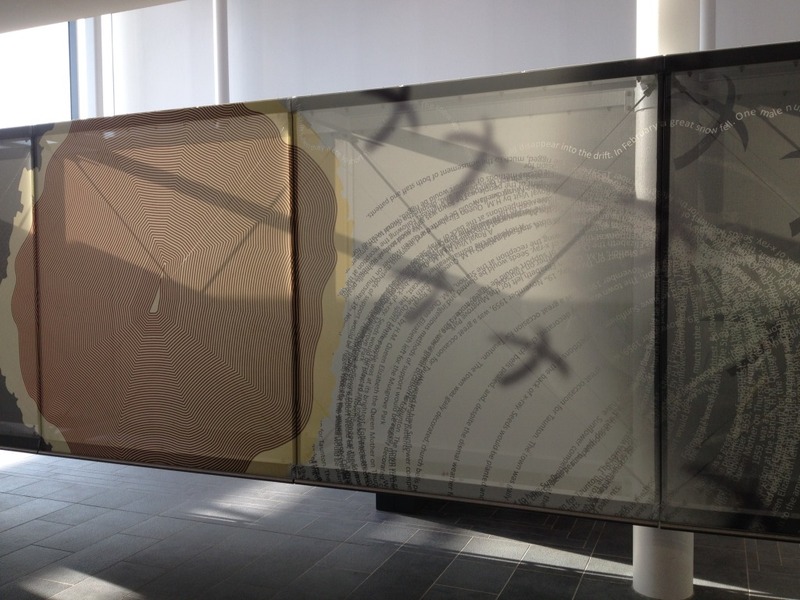 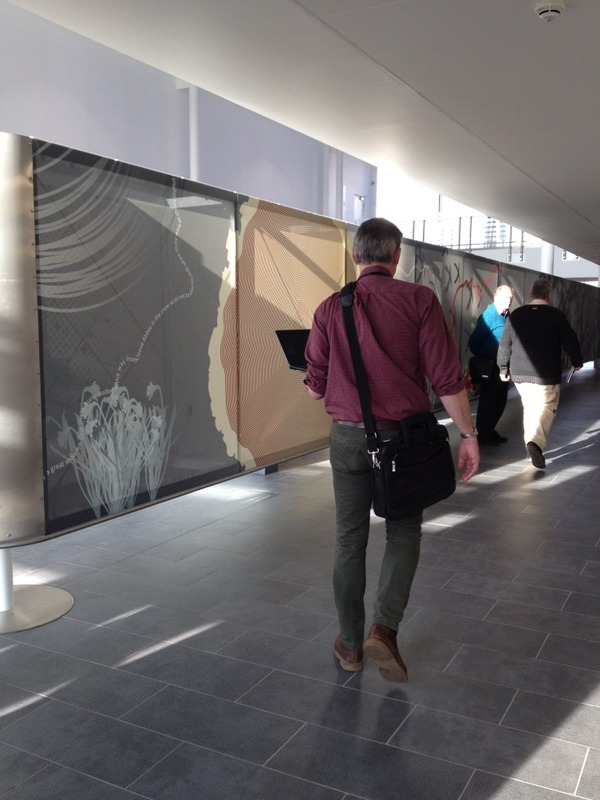 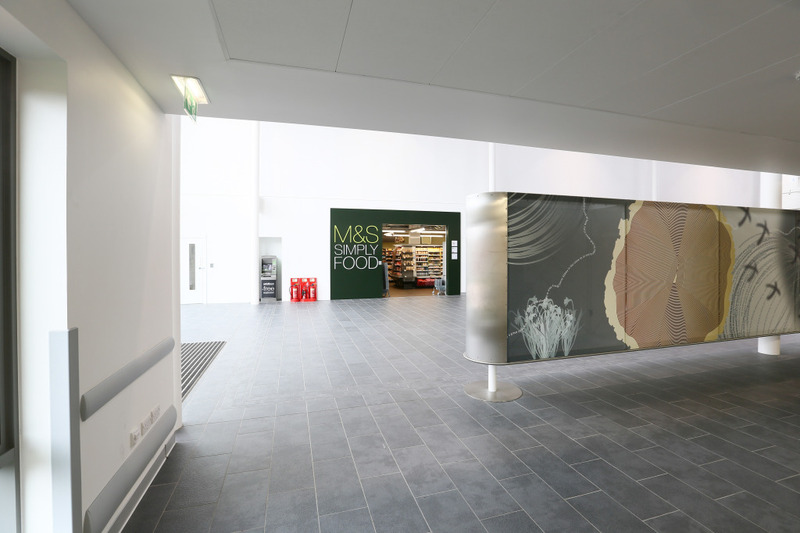 The design & manufacture of the tensile screen and its method of digital printing balance well with the content of the work & its evocation of the past to present a contemporary artwork in a 21st Century Hospital. 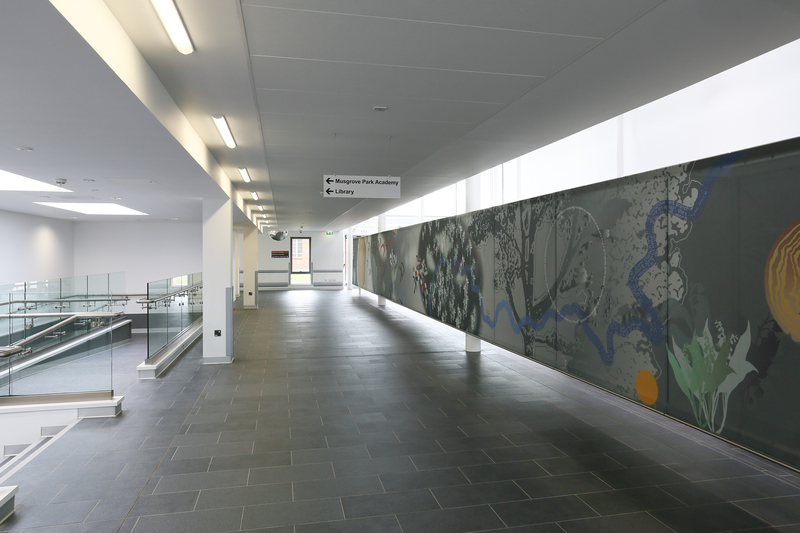 The artwork is presented as a landscape, which, other than at each end, where curved steel panels protect the structure, the artwork can be viewed as a continual narrative sequence. However, this is not a timeline or a linear narrative, which has to be viewed in a particular way or from a particular viewpoint. 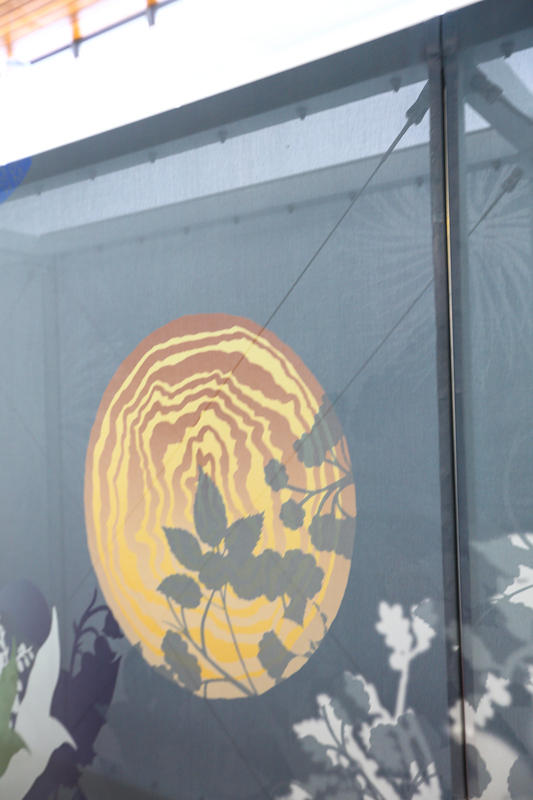 The observer can simply roll up at any point along its 42m length and begin a journey or their own. 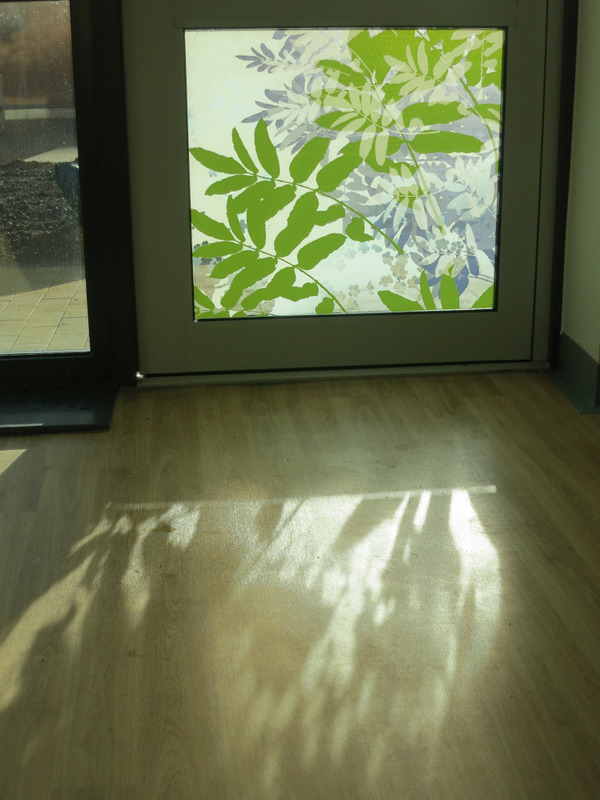 Words have been used to draw with, or to conjure up the dynamic energy of the hospital. 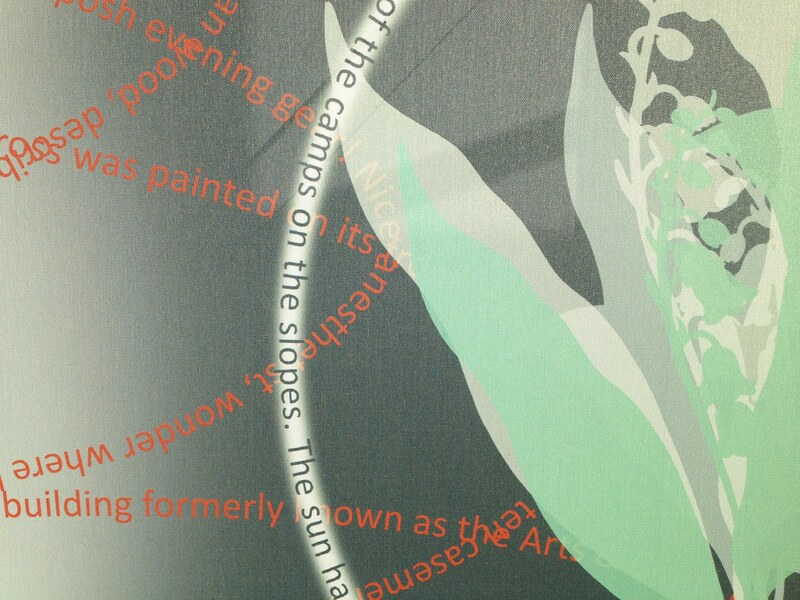 It is presented in a variety of ways, for example, following the line of the Galmington Stream, which runs along the boundary of the Hospital, or as a gestural expression, such as the whirlwind vortex drawing, or a simple circle of fine white text. 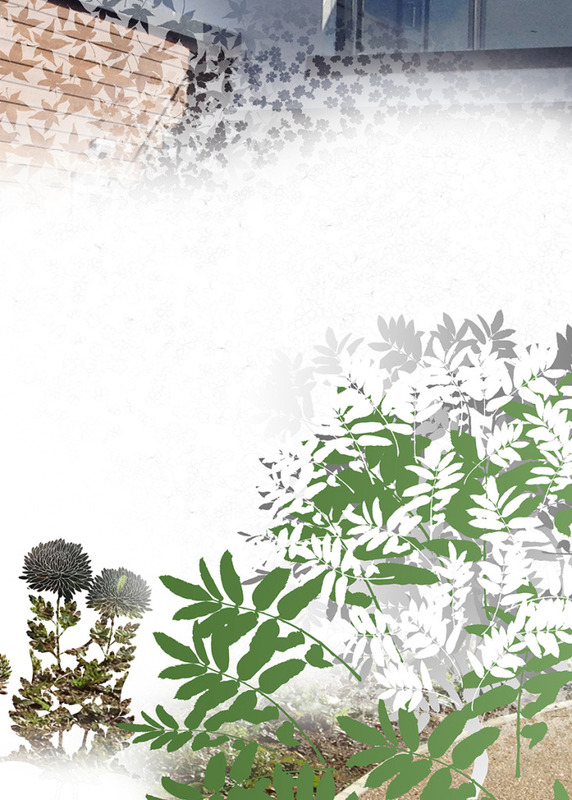 They are an eclectic and often mis-matched set of words, evocative of half remembered memories, anecdotes and stories, (as opposed to reproducing hard facts and figures within a fixed timeline). 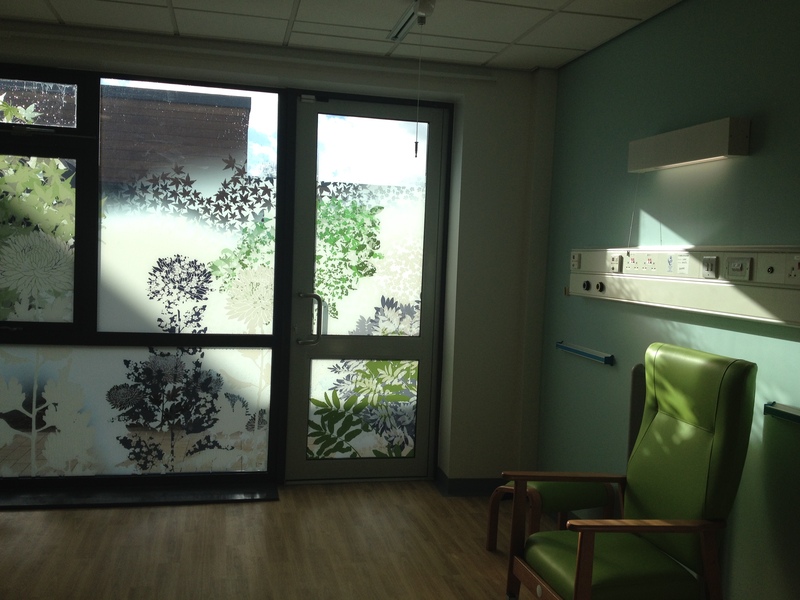 There are perhaps more ‘distant’ voices from early in the life of the hospital, particularly from it’s wartime experience, but I feel this is the way with memory – recall is distant and suggestive of the ‘good old days’. 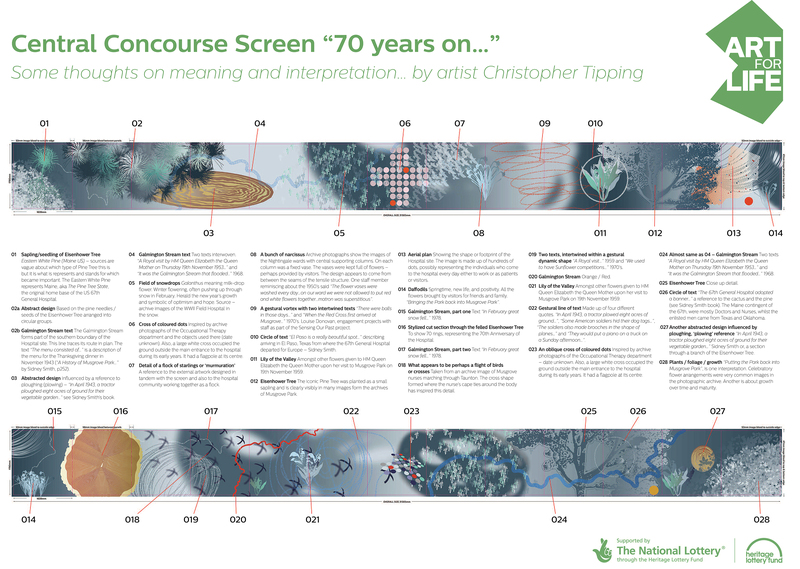 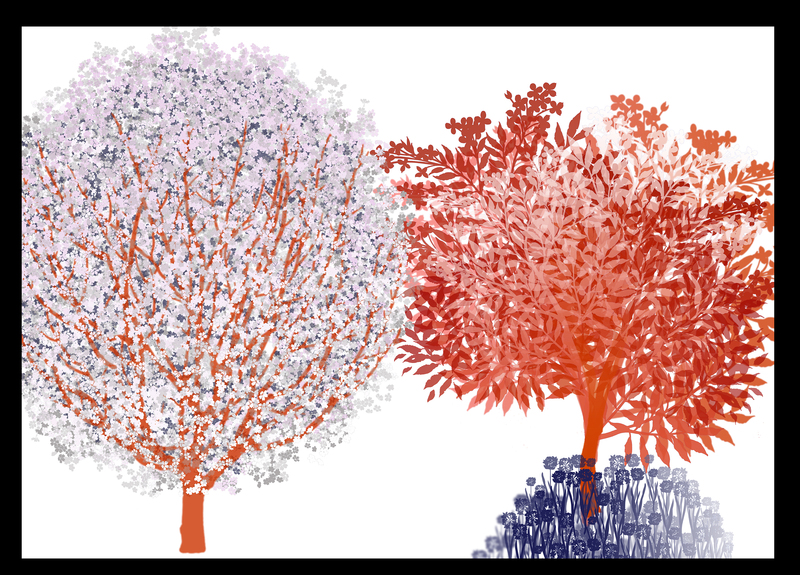 Some elements within the artwork are obviously and easily recognizable, such as the iconic Eisenhower Tree & Galmington Stream, whilst others are abstract and elusive. 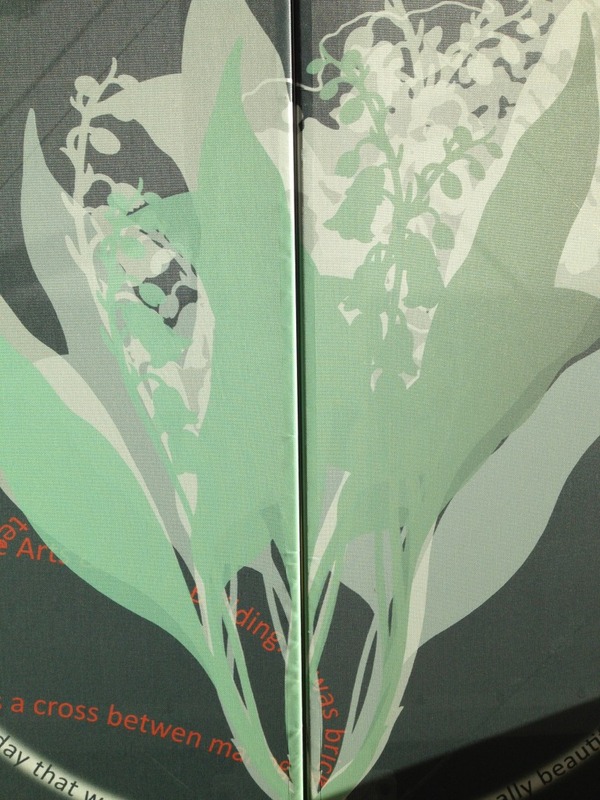 A great number of the references are archival in origin, such as the colours, which were influenced by boxes of medical artifacts, some in the original packaging. 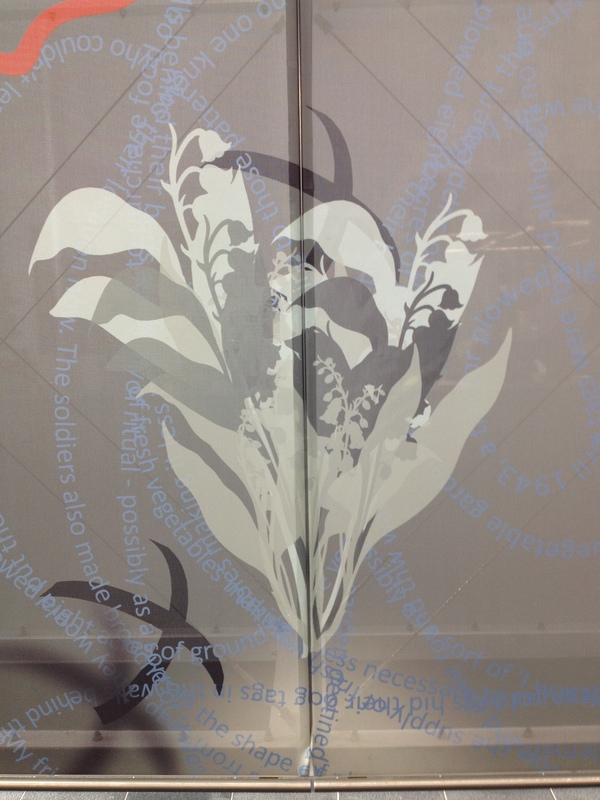 Bunches of flowers appear from between the seam joints, which evoke the Lily of the Valley presented to HM The Queen Mother or flowers given by visitors, which were held in vases attached to columns in the Nightingale wards. 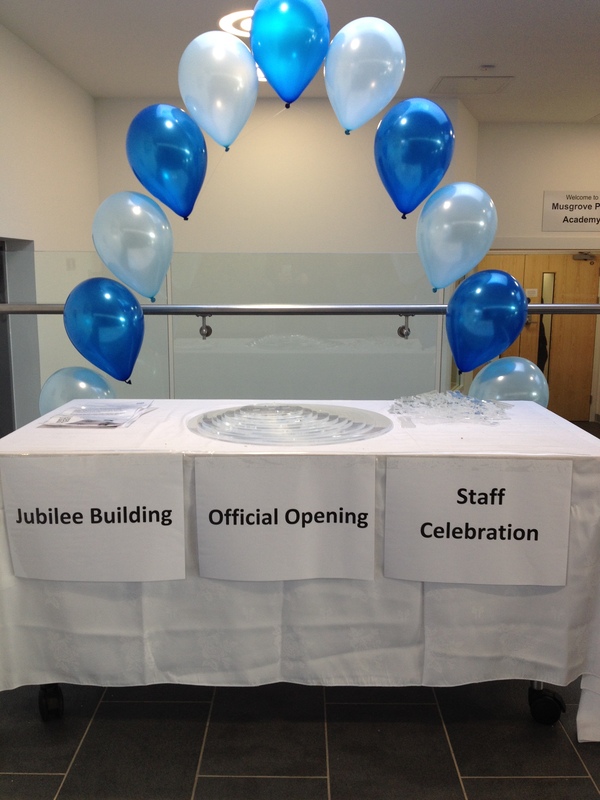 The photographic archive too, which contains hundreds of images of staff at work and celebrating events such as Christmas & retirements, as well as visits by Royalty, or the American World Heavyweight Boxer, Joe Louis and the entertainer Bob Hope, who both visited the Hospital during World War II. 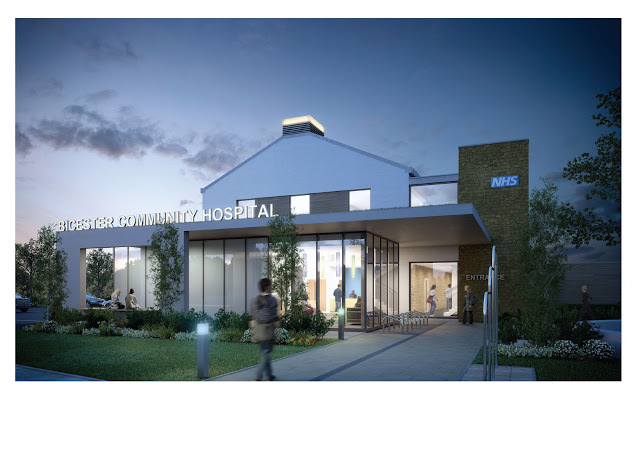 My own personal experience of being a part of this Hospital community since 2005, when I was appointed Lead Artist on the 10 year Hospital development programme is also evident in magery influenced by past projects undertaken here. 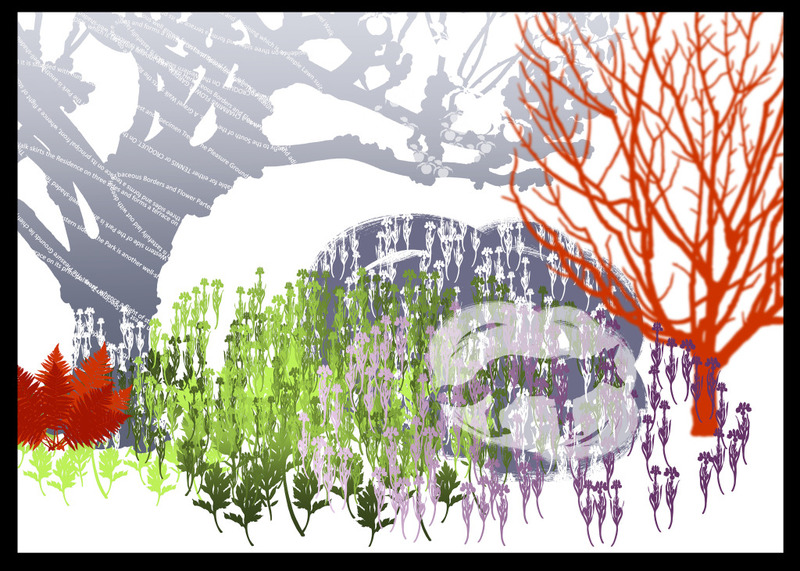 We now have a schedule agreed and are working to issue draft artwork for comment and hopefully, approval by this time next week. 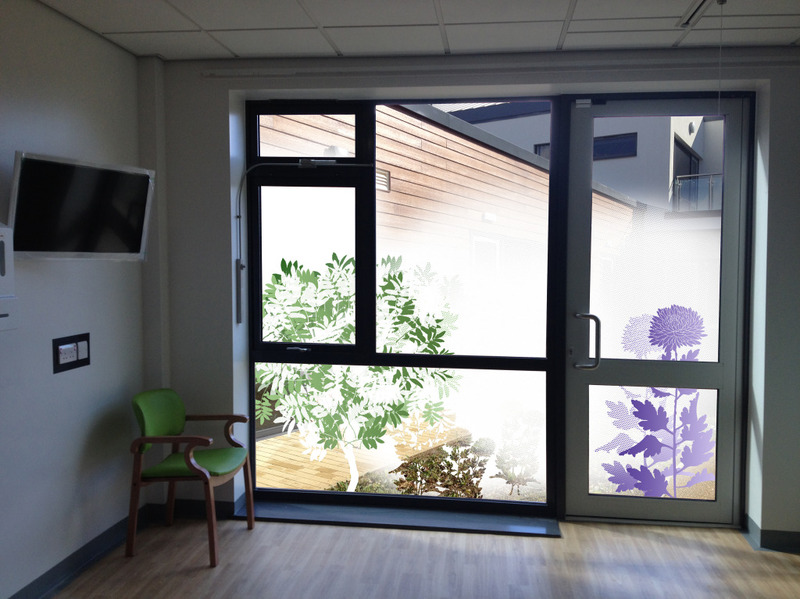 It was agreed that the principle we should follow is to develop a highly visual & primarily figurative narrative, which also provides a privacy screen between the users of the ward rooms and the external courtyards. 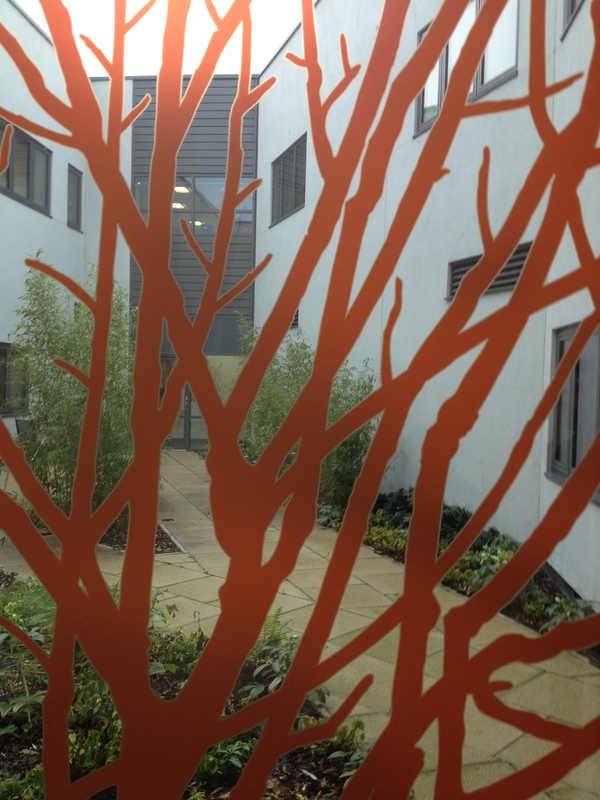 The courtyard landscapes are brand new, with ground level put to grass and no planting at height to provide cover or privacy screening. 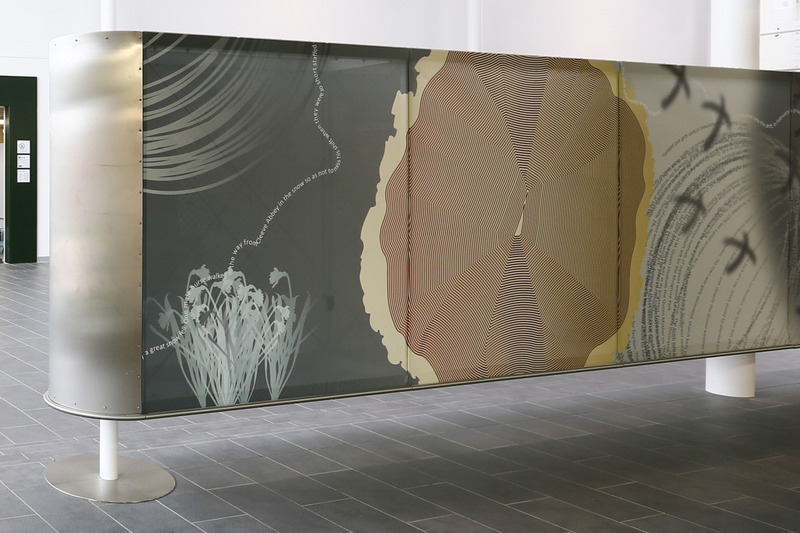 This has however provided the opportunity to create a new and imaginary landscape, which bridges the gap between figurative and recognisable details and structures from the external landscape, alongside abstract and original forms and patterns found within the artwork. 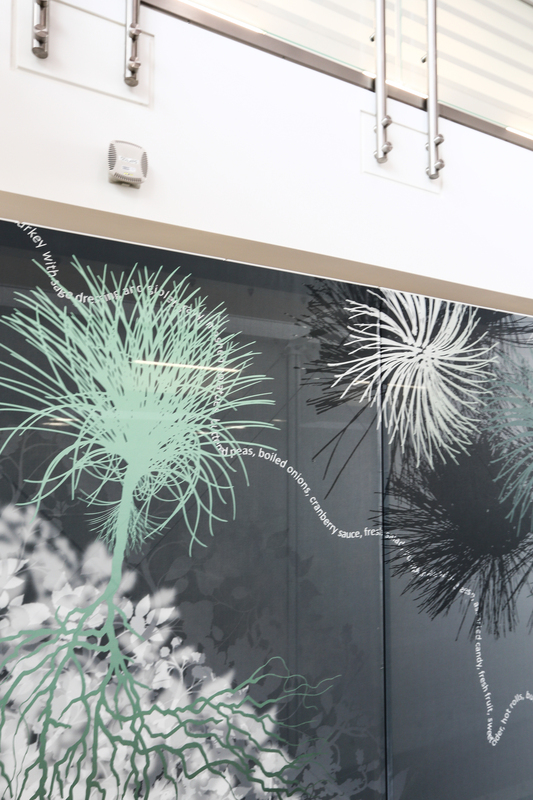 The works are to be digitally printed onto optically clear vinyl in layers of opaque and transparent white, with some added colour. 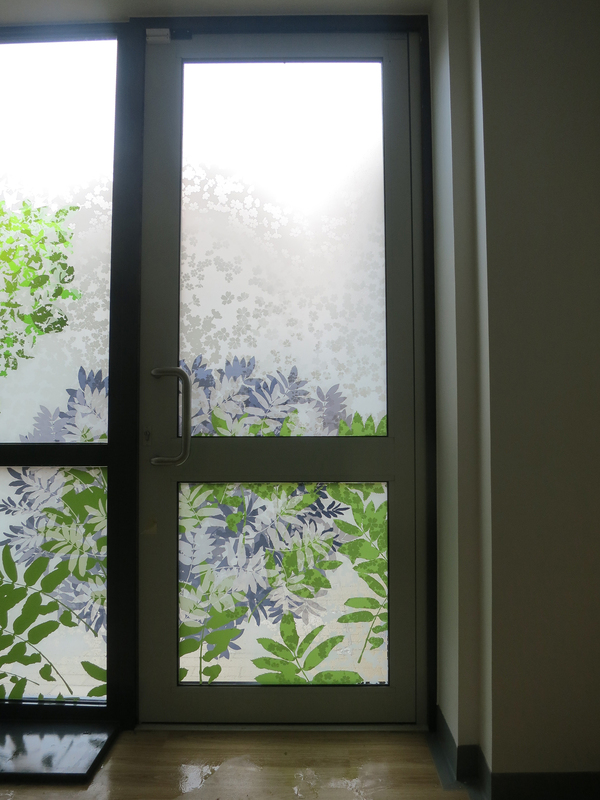 The attention to detail will be focussed on a horizontal band across the mid section of the glazing screen to provide privacy. 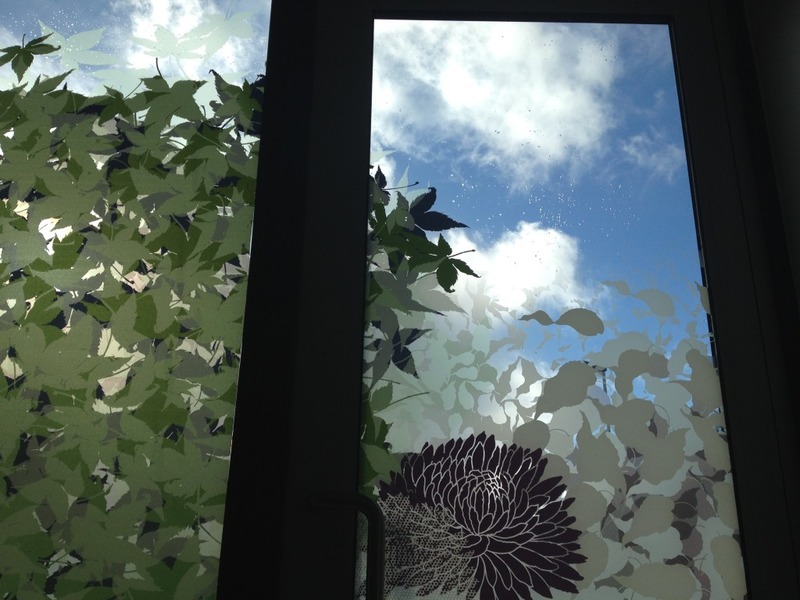 The top section will be left clear, so that uninterrupted views of the sky can be had. 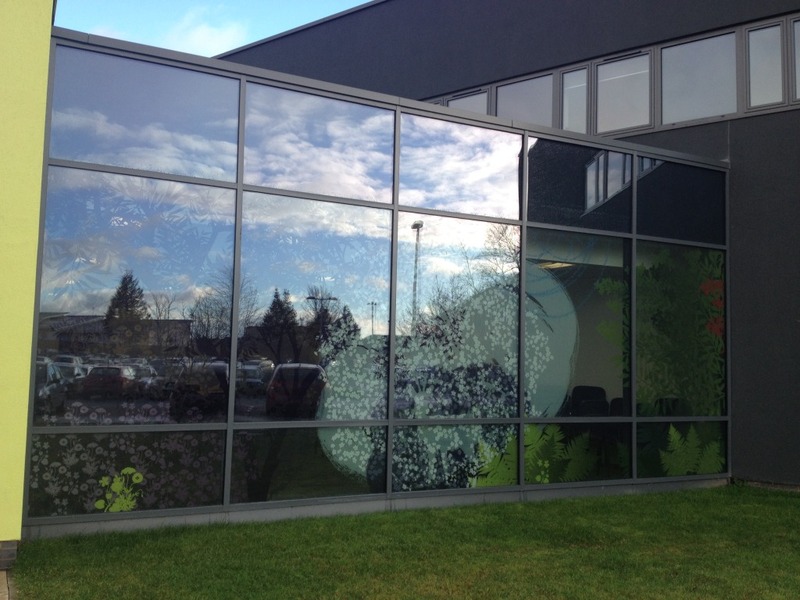 We are working closely with Guardian Window Film to manufacture & install the work. 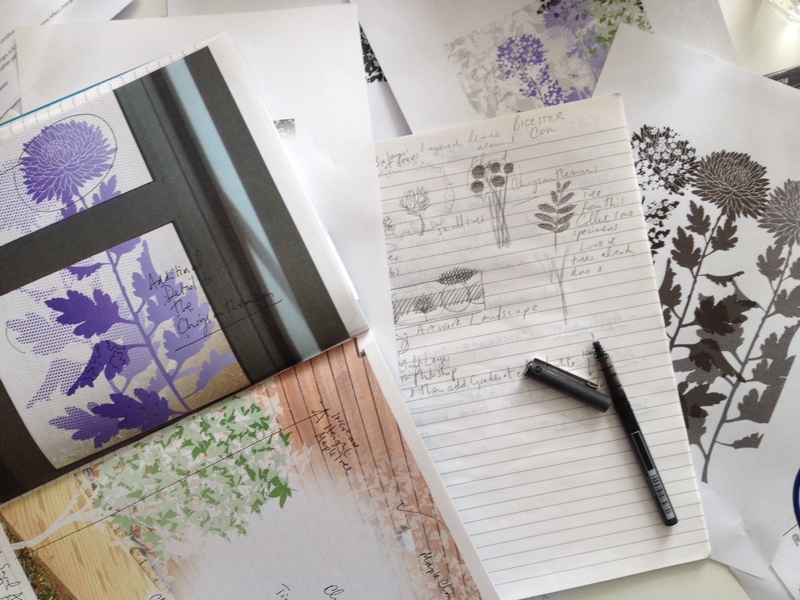 These images are simply the first steps in creating a visual language and narrative for the project. The artwork is being developed as a long rectangular landscape – as a view through a window – . 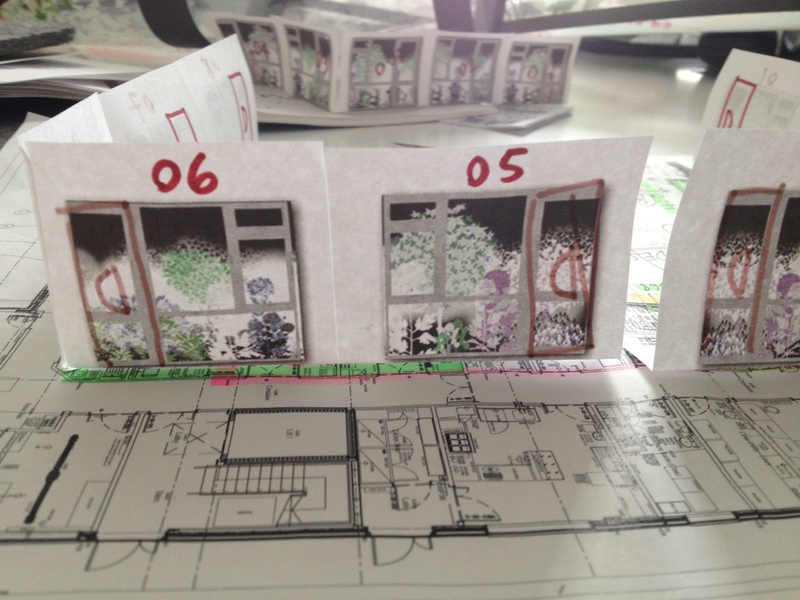 Each of the 10 ward rooms – each with a window, will be detailed with a section of this work, to give the appearance that each room has a unique identity and view of its own. 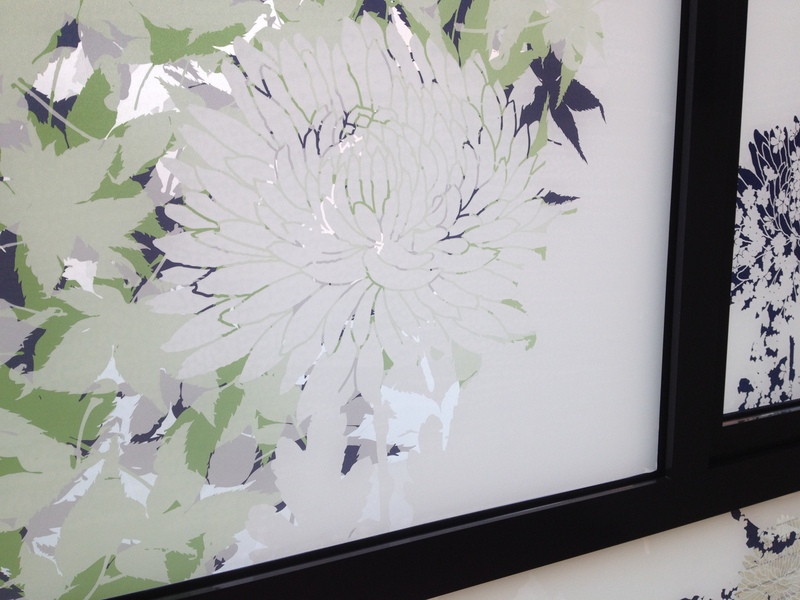 The artwork draft above shows the printed artwork as shades and layers of opaque white. 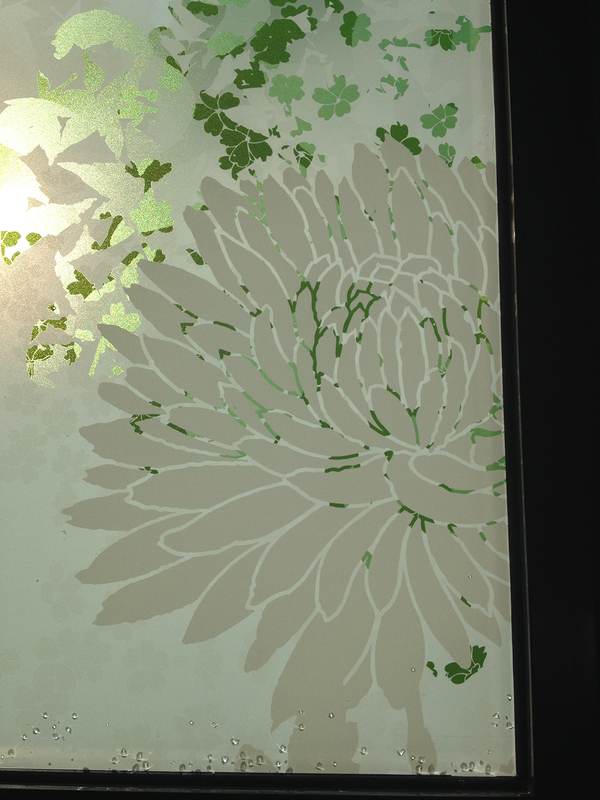 The black areas will show as clear glass in the final works. 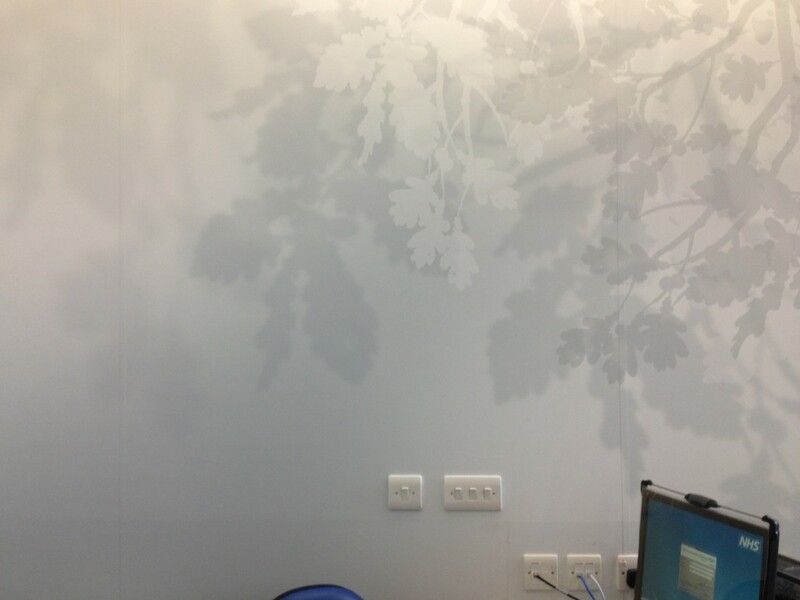 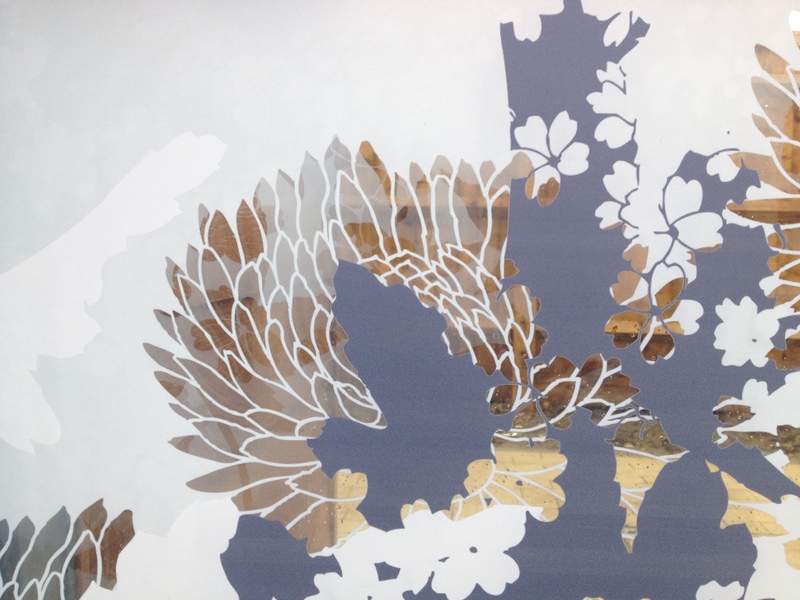 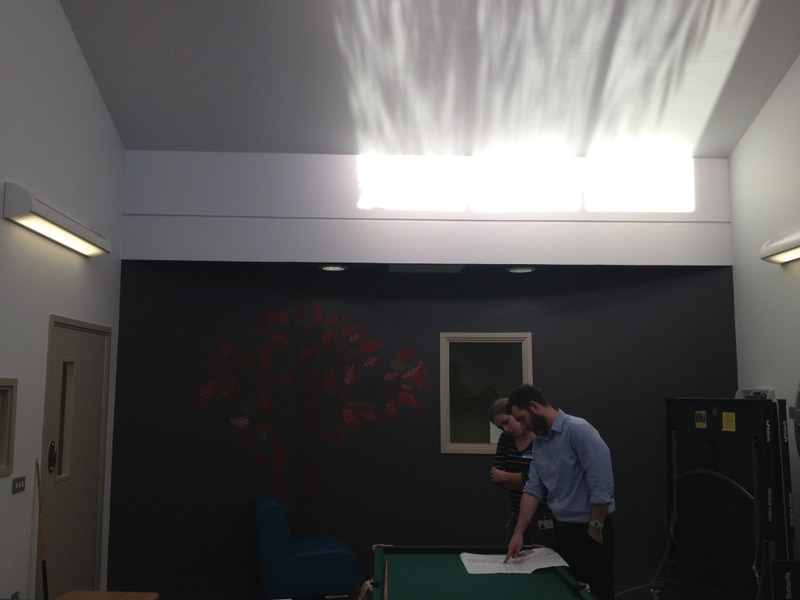 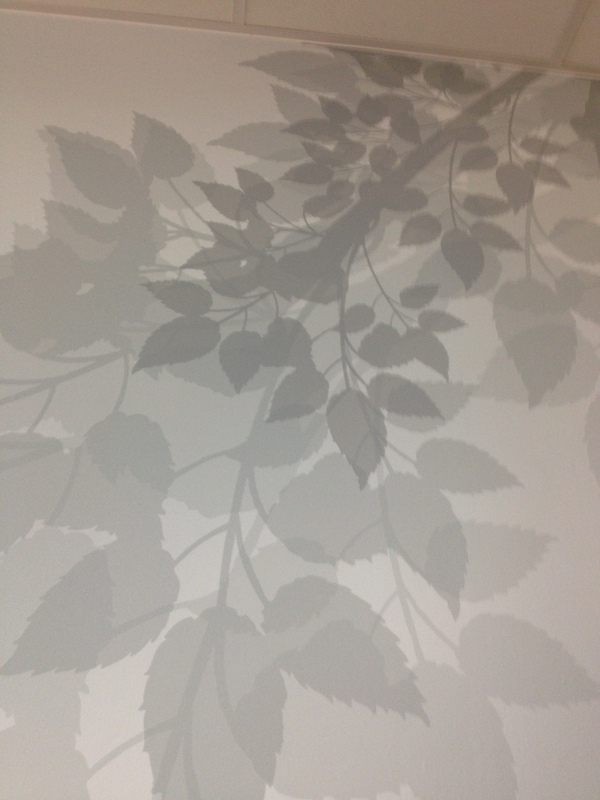 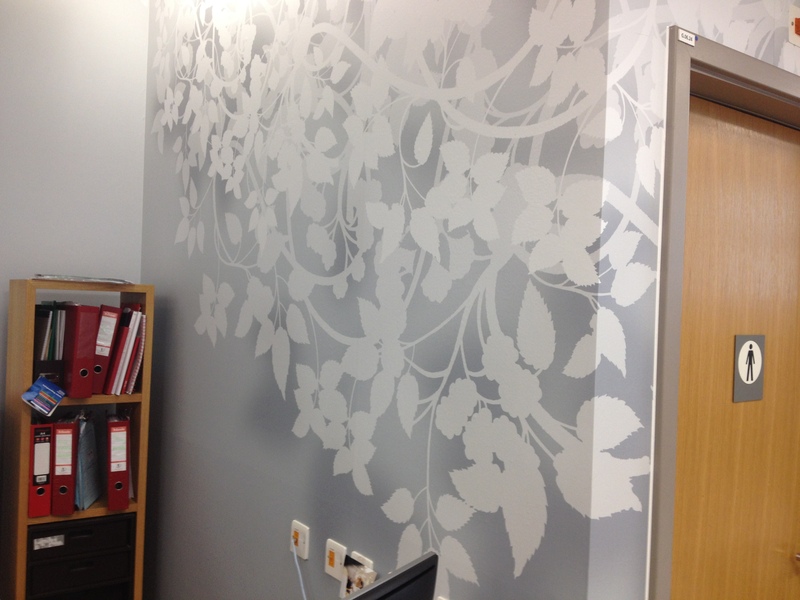 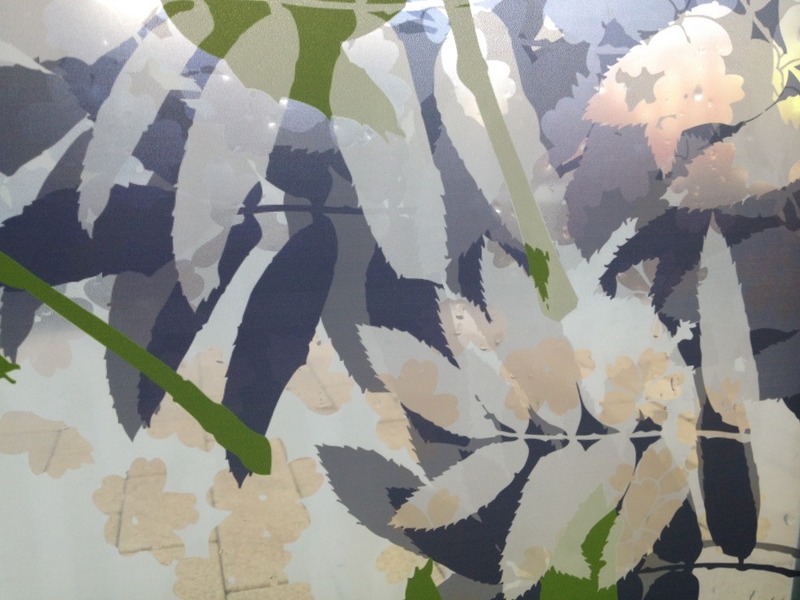 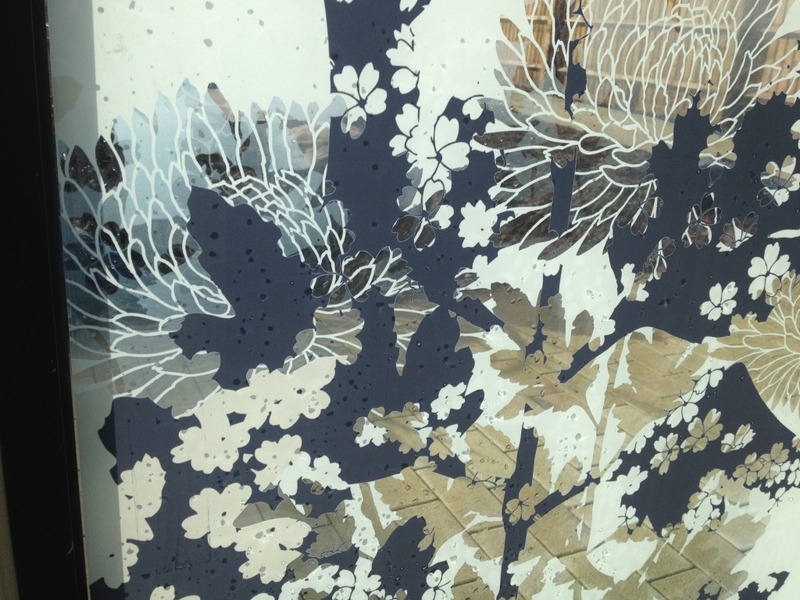 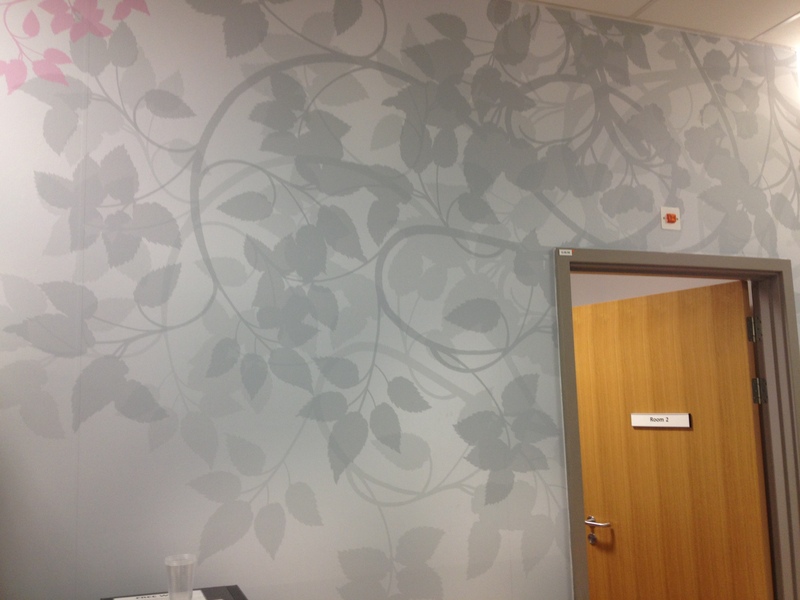 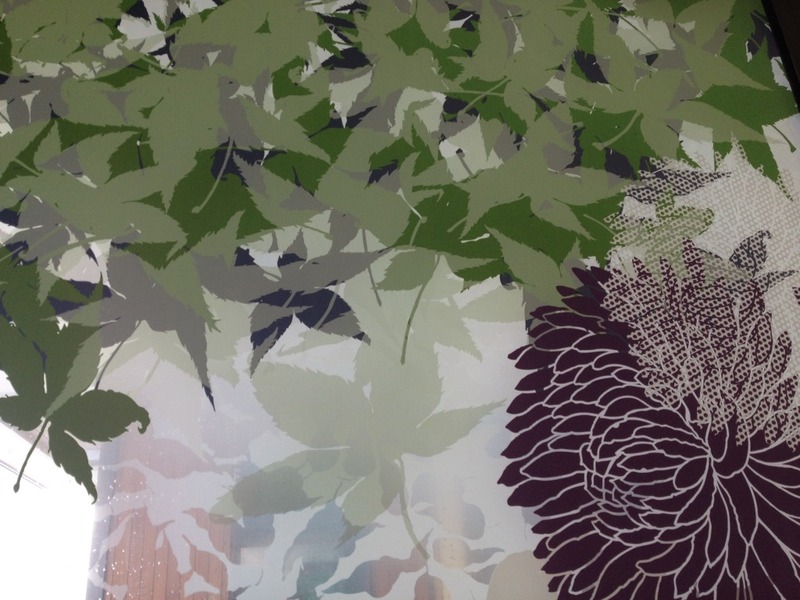 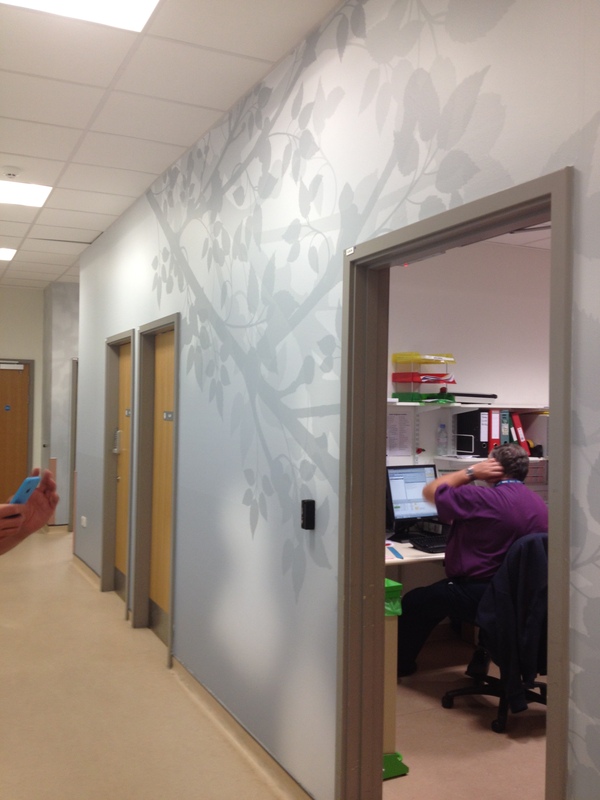 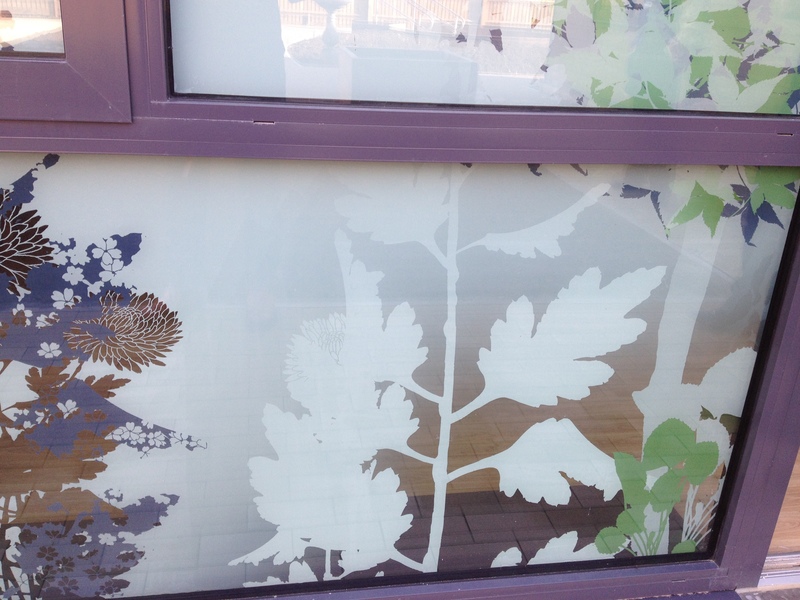 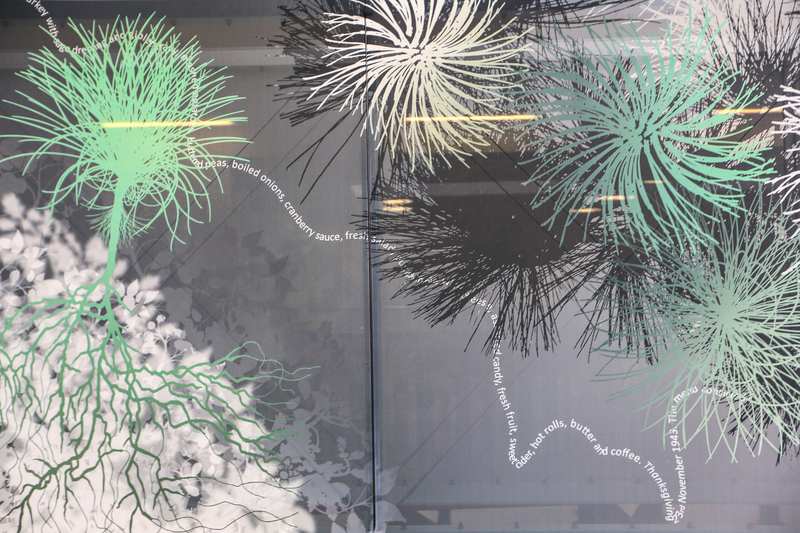 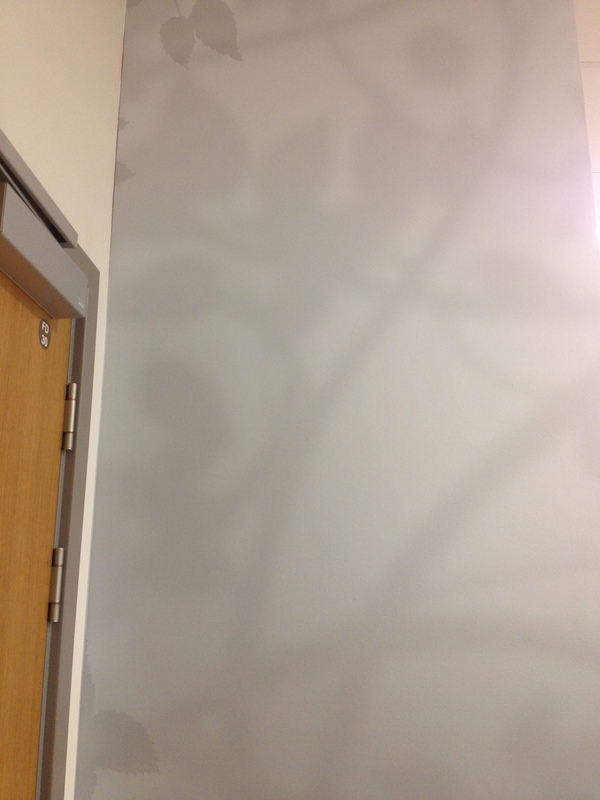 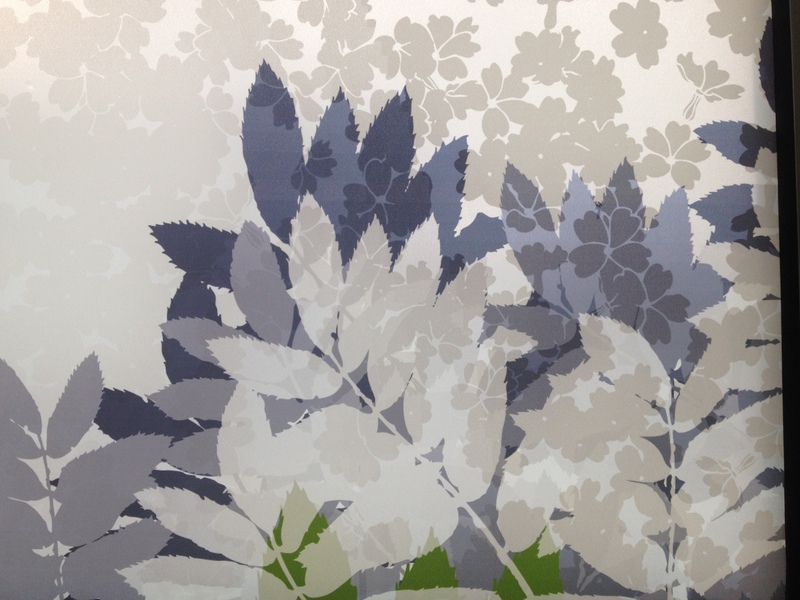 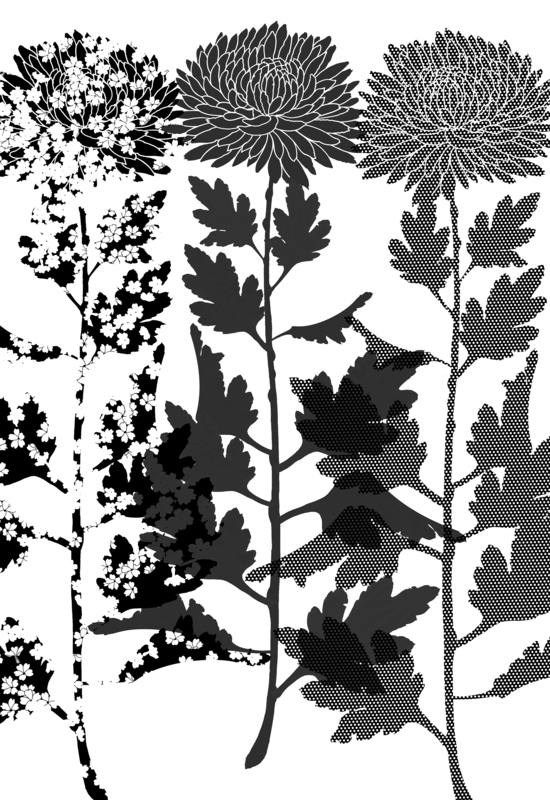 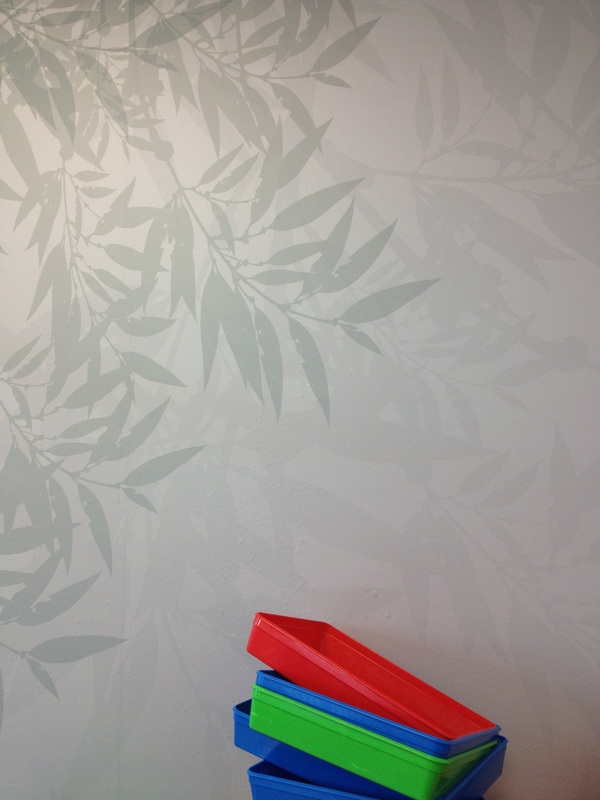 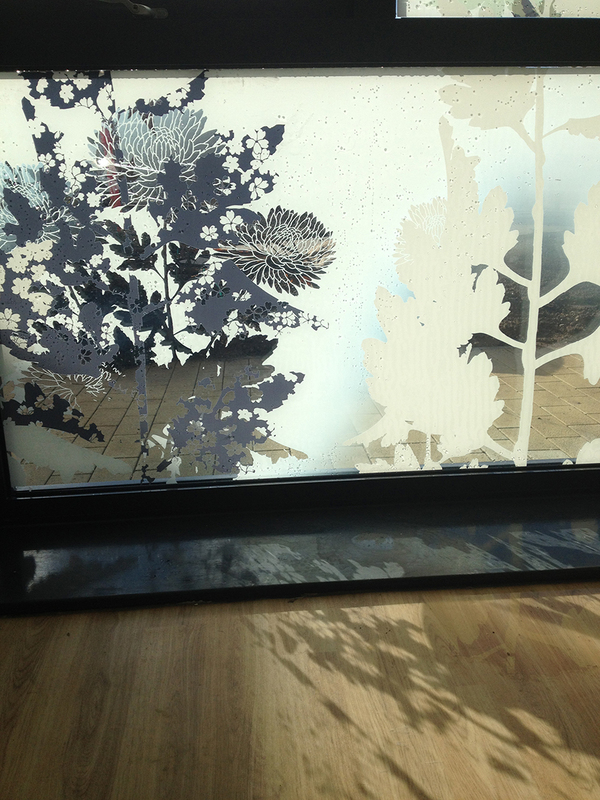 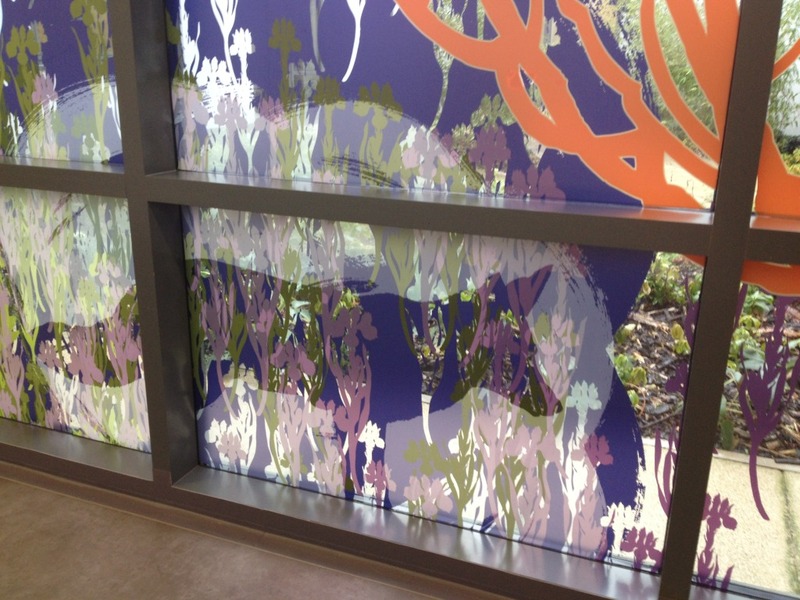 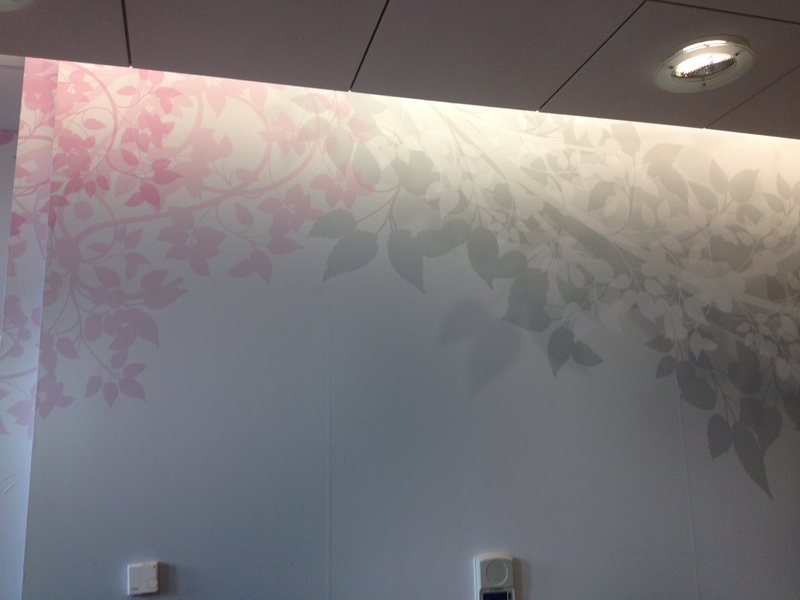 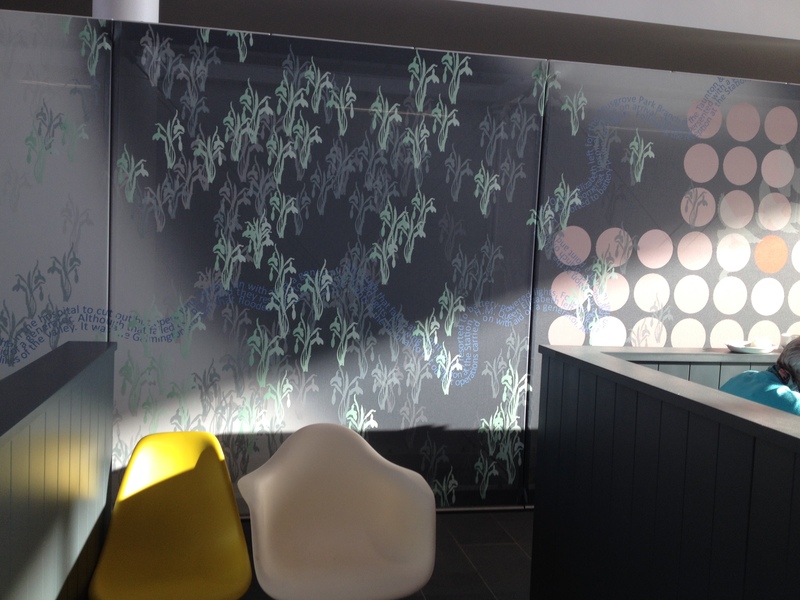 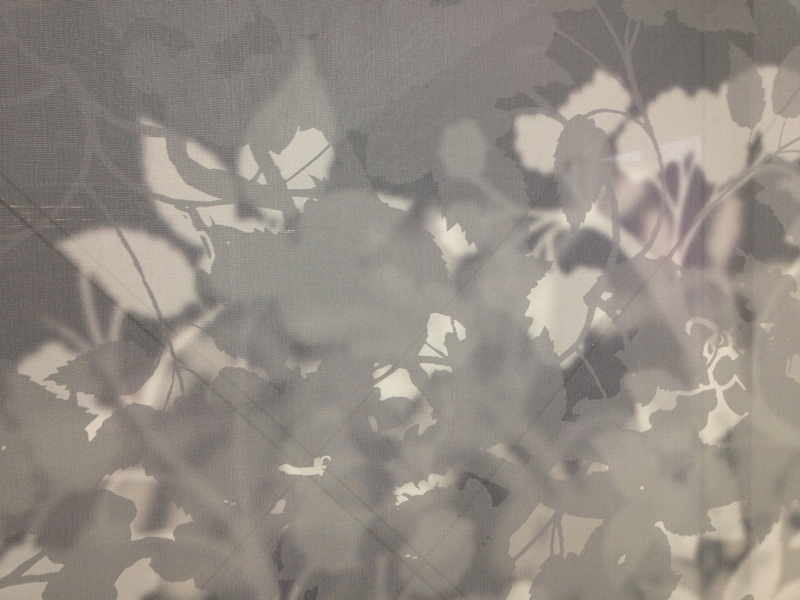 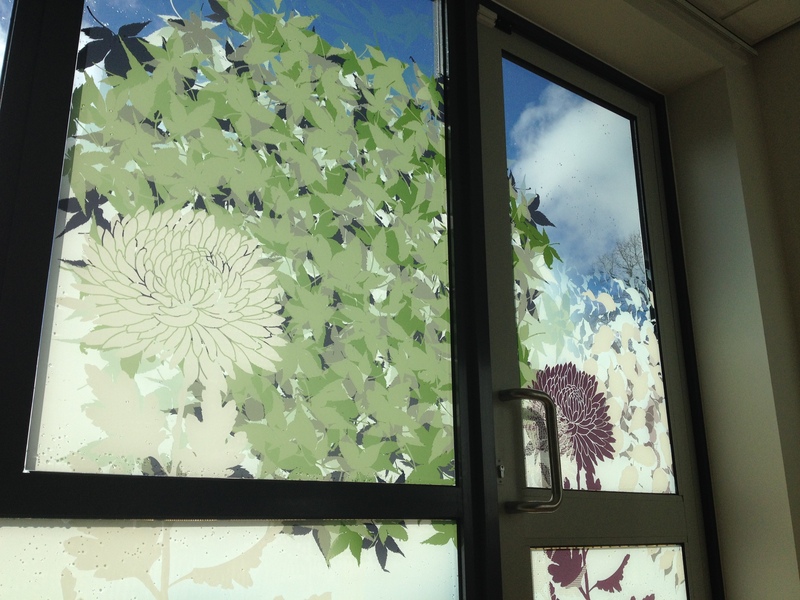 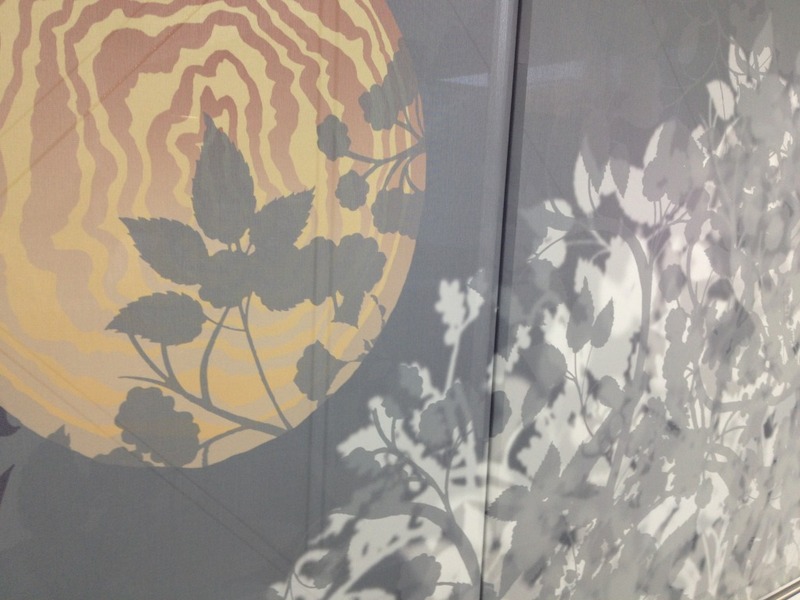 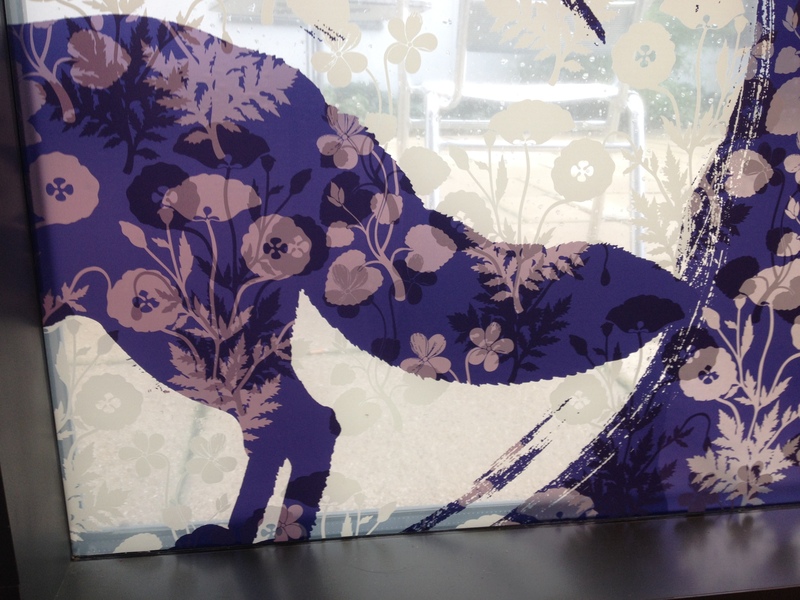 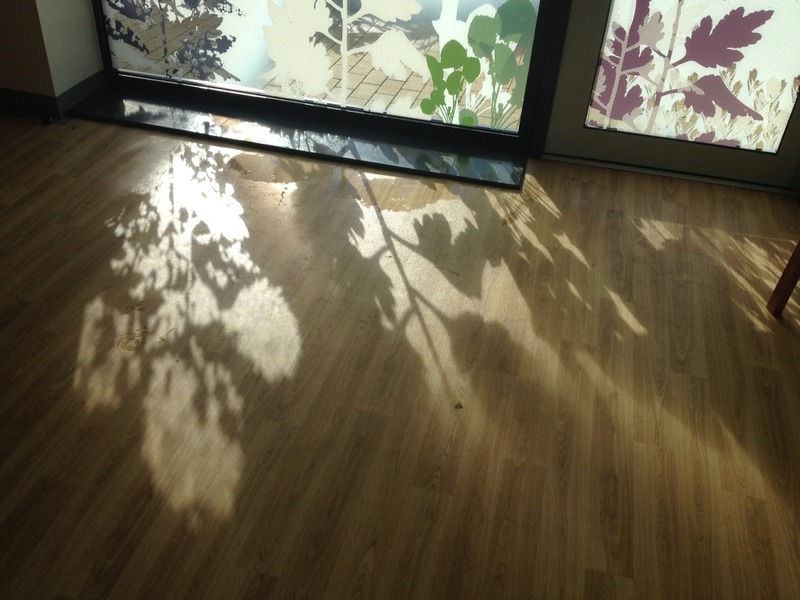 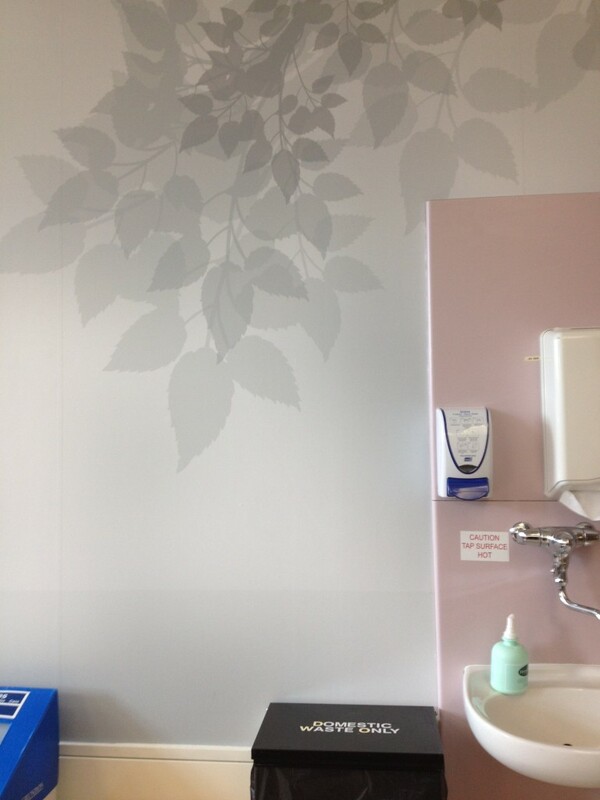 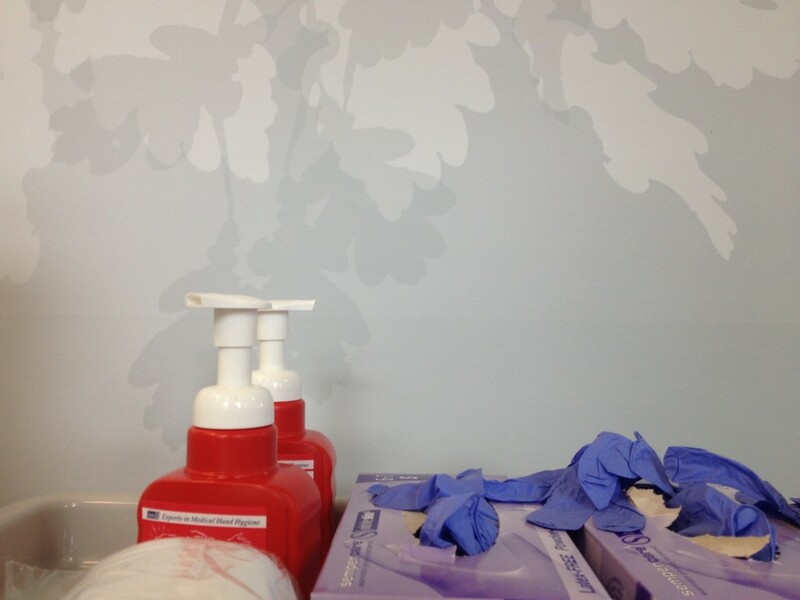 Detail: draft artwork – Mock up of vinyl application on the glazing screen in one of the ward rooms. 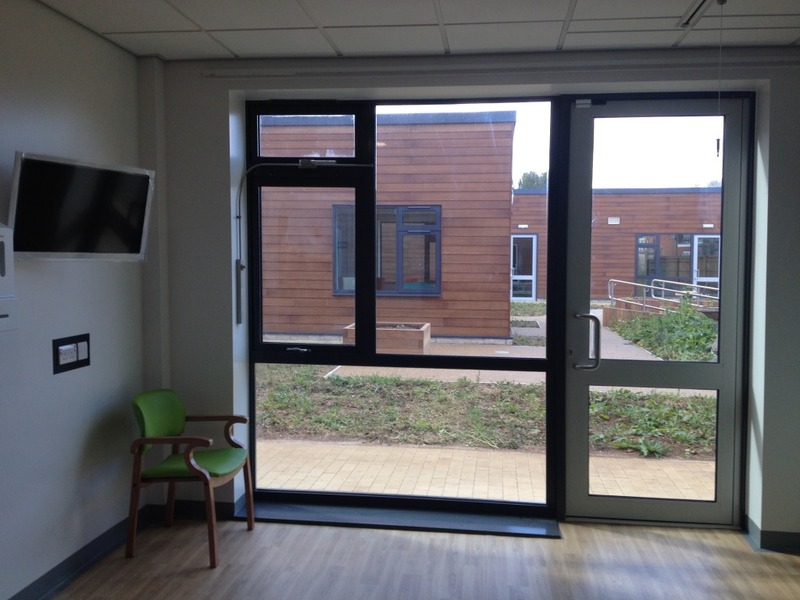 There are 10 small one & two bed ward rooms arranged in two ward blocks within the new hospital by Nightingale Architects. 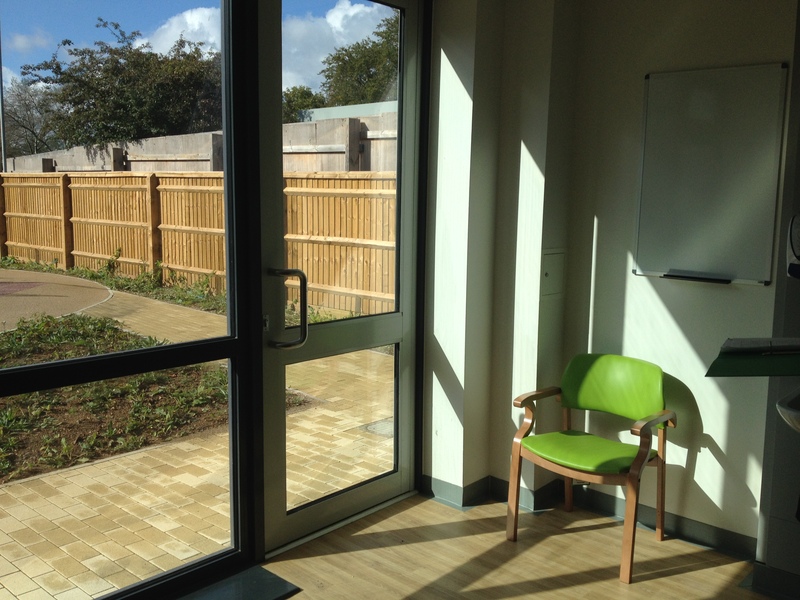 The rooms are full of natural light and the interior colour schemes are muted and calm, with the odd spot of brighter colour, such as the chair. 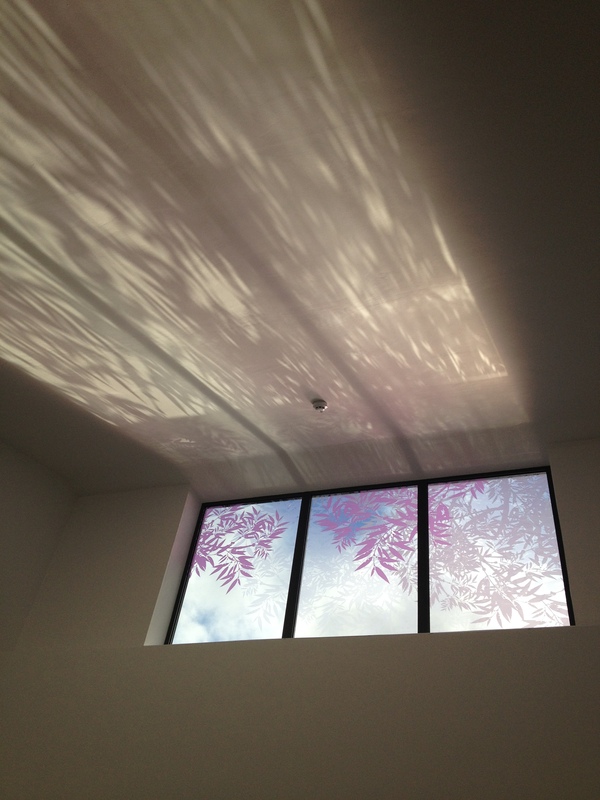 The artwork manifestation will respond to this scheme. 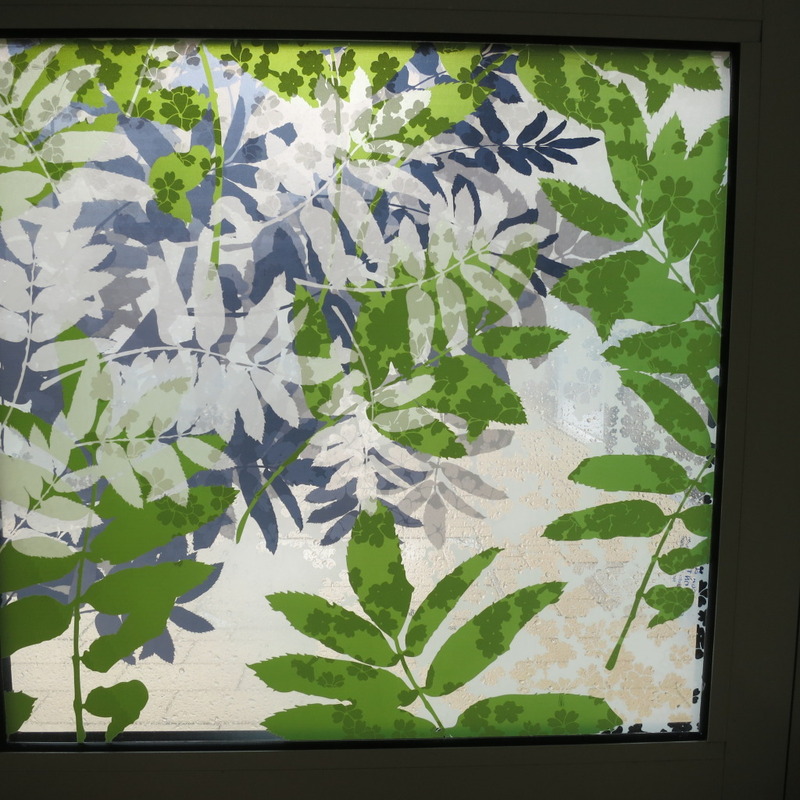 The views through the windows are now partially obscured, providing a degree of privacy for the user, whilst also maintaining sufficient clear glass to allow natural light and changing weather conditions to be seen. 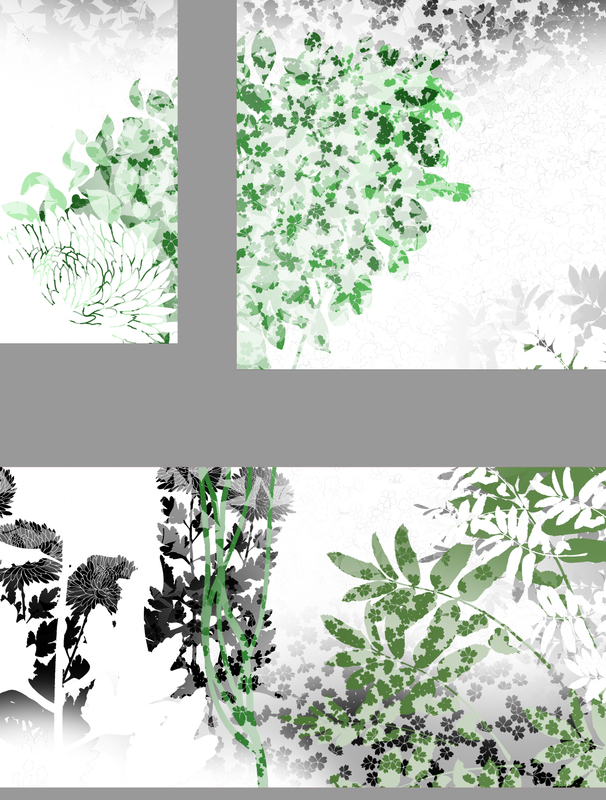 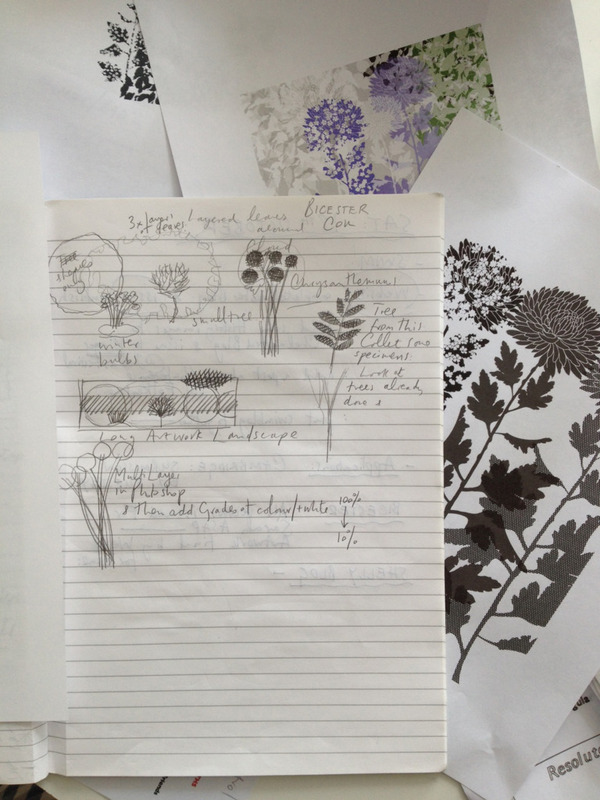 Detail: Iconography has been developed for the project using drawings of leaves and branching structures to create original & imagined plants. 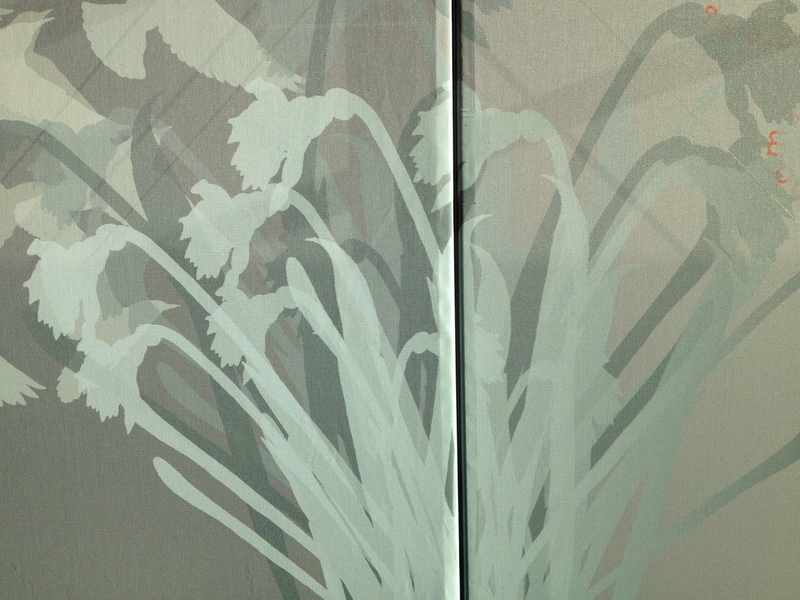 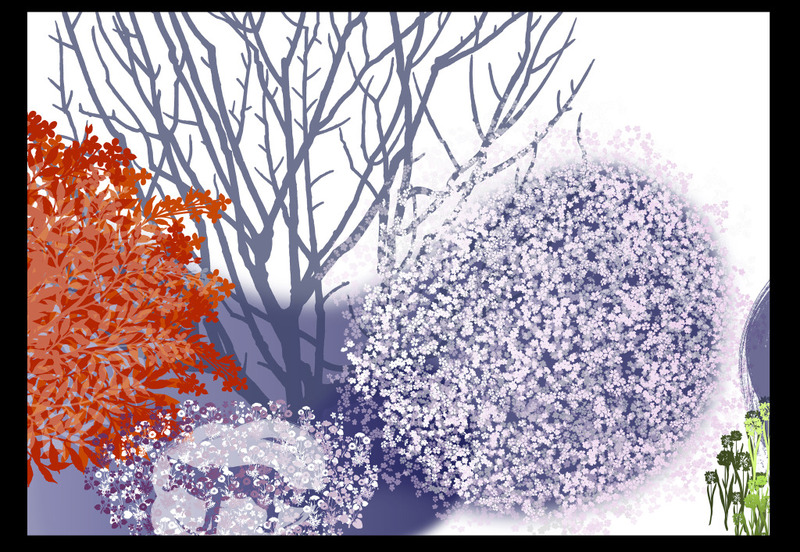 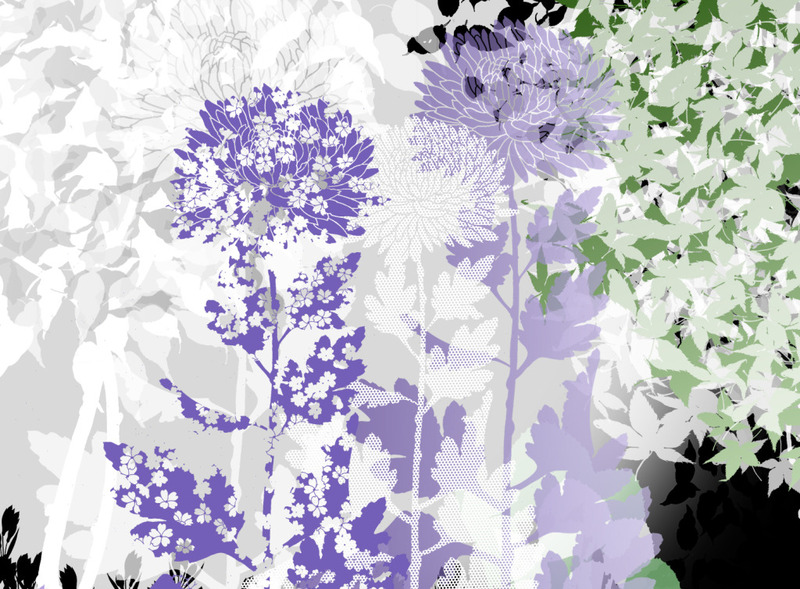 These are not botanical illustrations, rather, an impression of a landscape imagined.